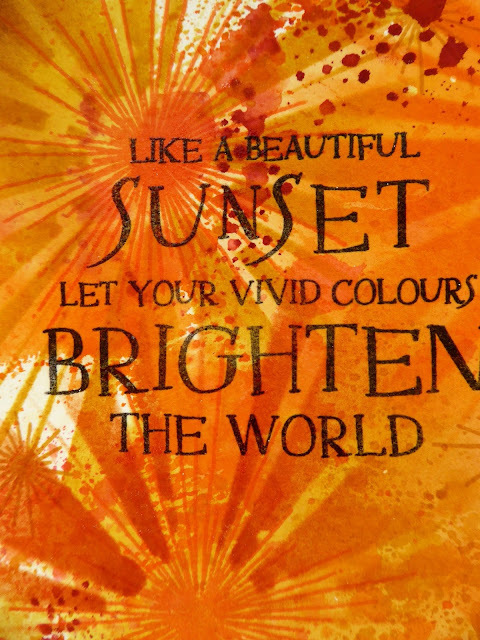 Today it is my turn to share & hopefully inspire you here on the Visible Image Blog so you know me I have another tag to share with you..
For today’s tag I decided to created a beautiful sunset to accent on of my favorite Visible Image verse Stamps. 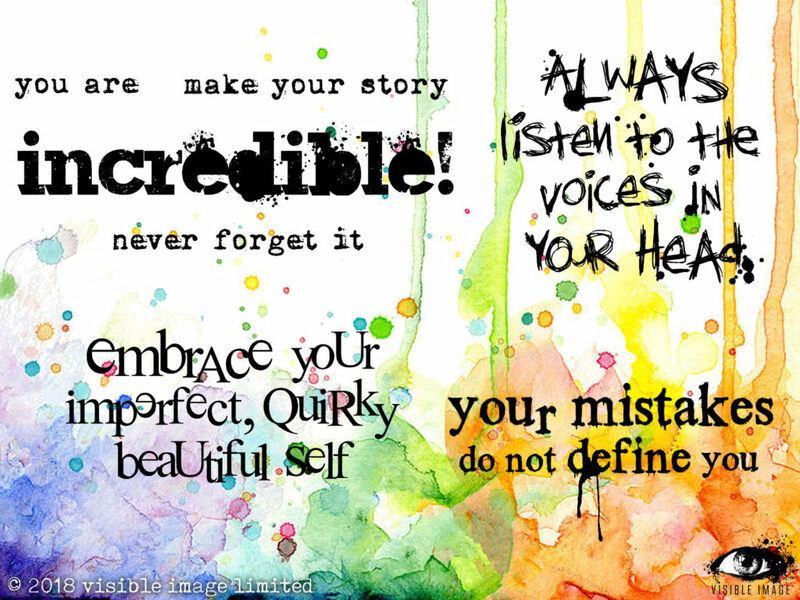 Your Vivid Colours, I just love this message and I really love how this turned out. 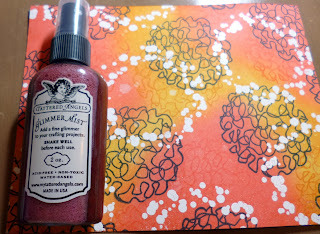 Other Products Used: Lindys Stamp Gang Sprays. Art Anthology Sorbet. Ranger- Distress Markers. Versa Mark Black Ink. Misc Ribbon. 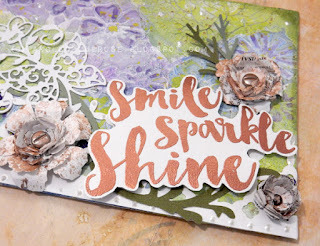 Prima- Watercolor Paper & Floral Dies. Wafer-Thin Tag Umbrella Dies. I just love this verse stamp its such a great message. 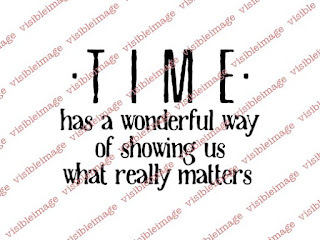 I just love Visible Images Strobes Stencil! Seriously look at this bit of Art Anthology through it. 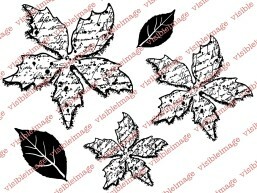 Make sure you check out the amazing new Stamps and Stencils! They are amazing!! We’ll be back later with a fabulous card from Sharon Traynor! Good Evening! We are back with more fabulous inspiration this evening. 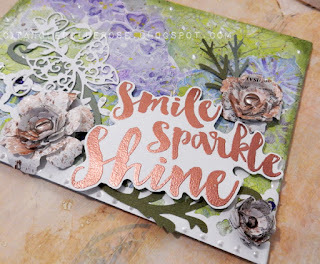 I’m back again with my latest make for the Visible Image DT and this time I’ve concentrated on texture using the stencils and the background stamps… and who doesn’t love a bit of texture! 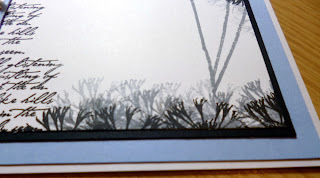 I started by adding Distress Oxide Ink Pads to watercolour paper to create a watery background and then, using the ‘Fibres’ stencil, I’ve applied modelling paste. Once fully dry, more colour has been added before flicking white Gesso over the 8×8″ background. You can see from the photograph, I have then used various stamps to add yet more layers before stitching around the corners to frame the card. I’ve then randomly stamped the number stamp from the ‘Somewhere in Time‘ set before adding the parallel lines from ‘Sparkle in the Rain‘ and the script from ‘Scripted Sheets‘. I didn’t want to add too much more detail to the card, so kept it fairly simple by adhering a die-cut heart that has been coloured and then had a thick layer of crackle paint added. Again, I love the extra texture this adds, especially as it’s flaking away in parts. 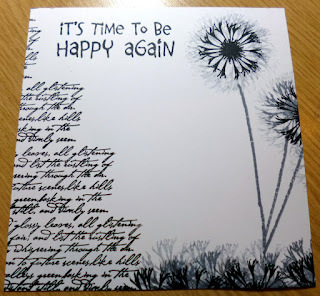 To finish the card, I added a simple sentiment courtesy of the ‘Just be Happy‘ stamp set which has been backed onto black card and adhered to the card using 3D foam dots. Regular followers will know what a huge advocate of texture and layering I am and the Visible Image stencils are perfect for this. When combined with the stamps, the images you can create are never ending! Thank you all for looking… see you again soon! 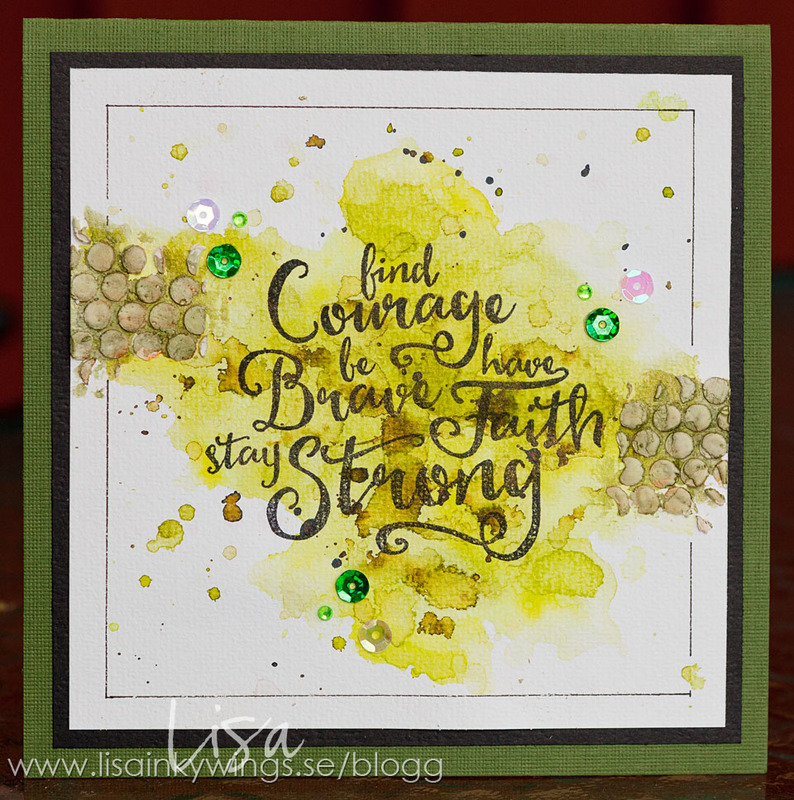 We will be back tomorrow with gorgeous inspiration from Lisa Taggart! Hello! We are back as promised with more fabulous inspiration this afternoon, here on the Visible Image blog! It’s my weekly dose of Visible Image stamps inspiration today. The new stencils are back in stock here on the website and I have been having fun with them. A few weeks ago I shared my Blue Snow Queen card.. if you missed her check out my post here. I adore the Face it stamp set and, inspired by the glorious sun that peeped out during my autumnal walk, I made something with the eyes open stamps from the set. 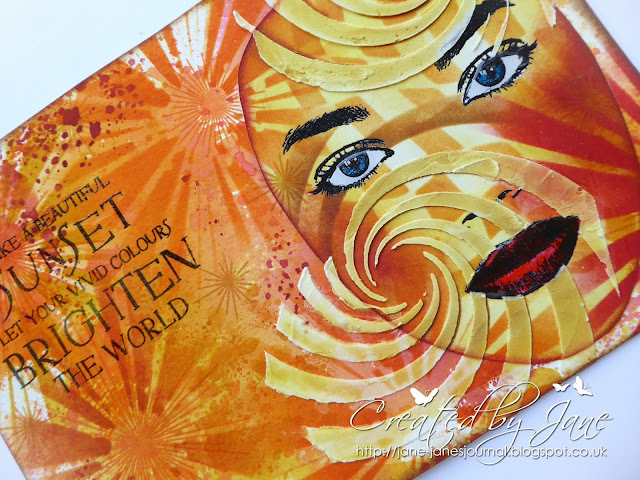 I also decided to go from a cool to a warm colour palette and had the idea to create a Sun Queen as an art journal page. I often use the mask from the Face shape stencil & mask set but this time I decided to draw round it and make a separate cut out face which I could decorate first and then stick to my card to complete. I used masking fluid on her eyes and lips to protect them from the inks. I then added texture paste through my time tunnel stencil using the first brown swirls as my guide. Thanks so much for stopping by today. Enjoy the sunshine if you get some, smile at the”Sun Queen” ? if you see her, and delight in the gorgeous colours of autumn. Wow! Such an incredible journal page! Thank you Jane ♡ So much to discover with all the stencilling and texture. LOVE those Autumnal tones! We will be back later with more brilliant inspiration. Hello there! We hope you have had a good start to the week. 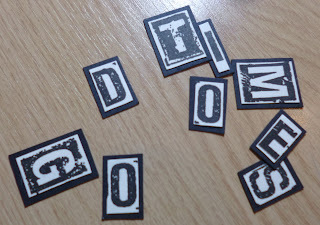 It’s my turn to share a little something I’ve created using some awesome Visible Image Stamps. 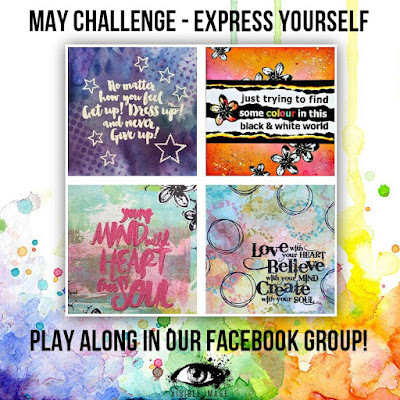 Visible Image have a new themed challenge and the theme for May is ‘Express Yourself’. to spend on some superb Visible Image stamps! and heat embossed in Black, and used a white pen to highlight the letters. We will be back soon with something cosmic from Nicky Gilburt! Hello! We are back with some absolutely gorgeous inspiration for you this evening. This month Visible Image started a new series of monthly challenges in their Facebook group. Playing along is easy; get inspired by the monthly theme, take out your Visible Image stamps and start creating! Upload your project to the May challenge album, and you might be the lucky winner of a £40 gift card in Visible Image online store! How cool is that! For all these three cards I used my favourite quote stamp, ‘Laugh Louder’. The basic design is somewhat similar on these cards, but I used the same stamp in 3 different ways. 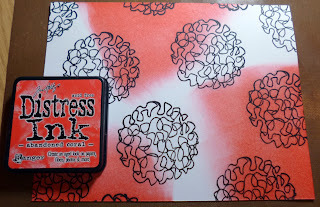 On this first card I stamped the quote with black ink on a red Distress Paint coloured background. The lovely red texture did not require too many other elements to be added, so I just placed two die-cut flower stems on the sides. 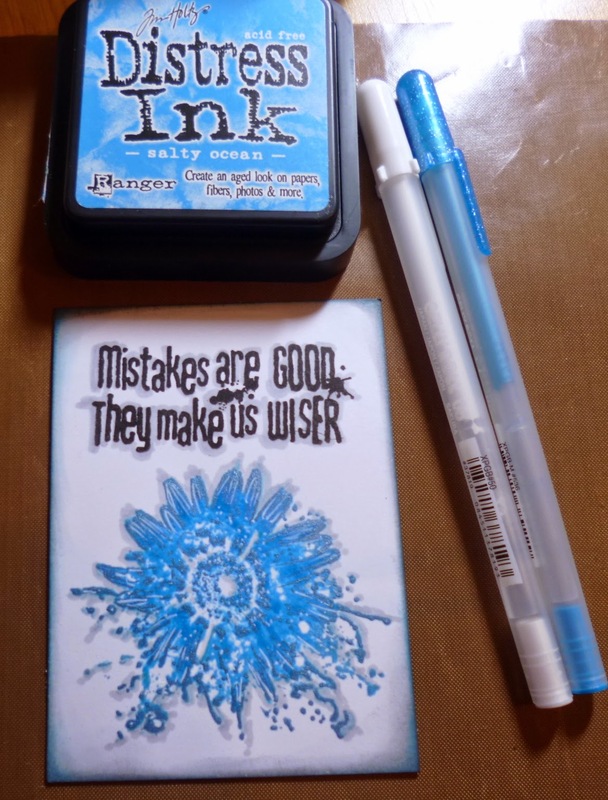 On the second card the quote is stamped with two inks. 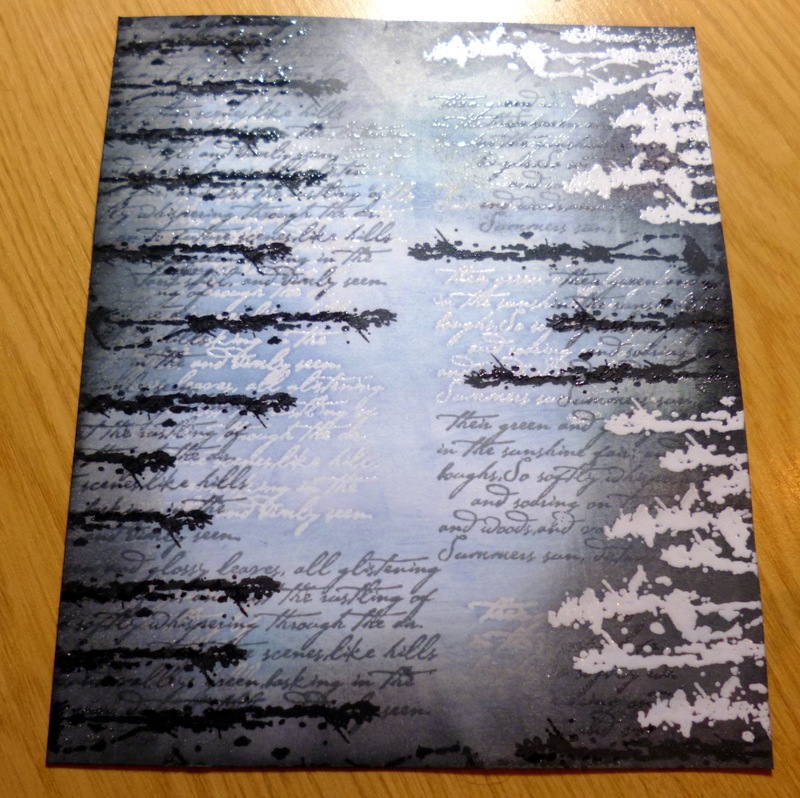 I did not use any masking, but applied the ink on each word using a small ink pad (Tsukineko Memento Dew Drops). There’s just enough distance between the words so you can ink each line separately without mixing the colours. The third card is a small ATC. I wanted to use only the last two lines of the quote, so I masked the above lines with a post-it note before stamping. The background is a leftover piece from my first card. I hope you get inspired to play along. Many of the Visible Image quotes are just perfect for this month’s theme, and I guess the most difficult part will be the choosing between your favourites! Loving these cards so much! 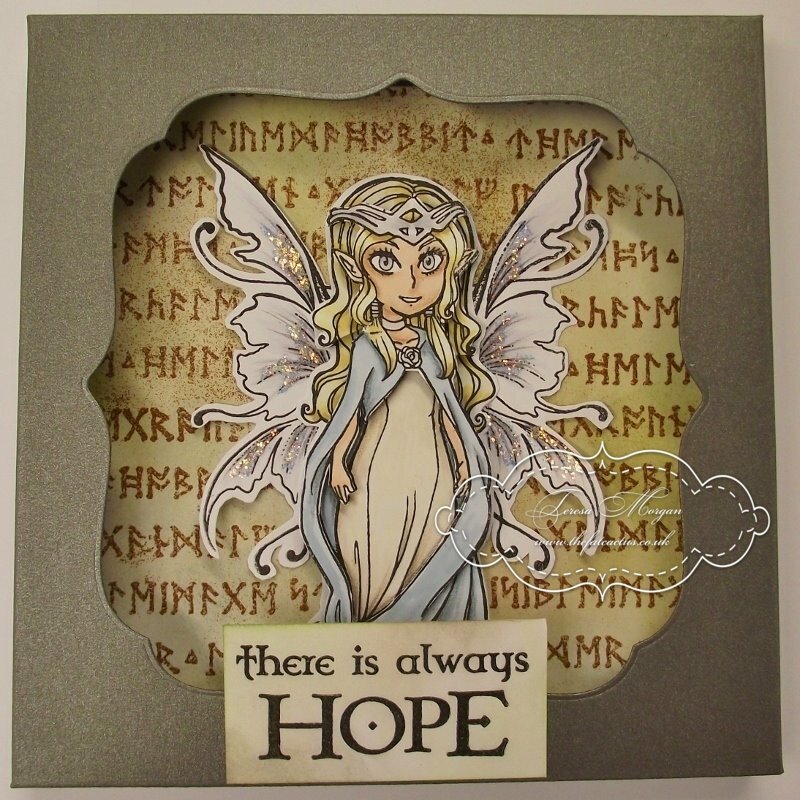 Absolutely stunning.. thank you Elina ♡You can find more of Elina’s gorgeous cards and projects over on her blog. 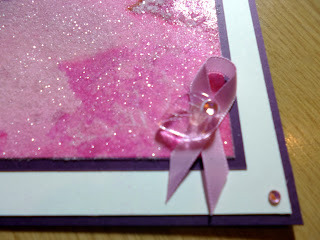 Stay tuned as Teresa will be here on the blog a little later with another super gorgeous card! We are counting down to our Create and Craft TV show this Saturday… Mark is busy prepping his demos so I thought I would have a bit of creative ‘time out’ yesterday too. We have our awesome Visometry set on the show, so I wanted to have a play and show you how cool these stamps are! You might remember playing with a spirograph as a child? I adore these stamps, there is just so much you can do with them! I love how they look embossed in white, so this is how I started my card.. I repeated the technique using picked raspberry.. still one of my favourite colours! I continued to add more of each colour until I was happy with my background. Now to decide which words to use! decided to do with our Never Give Up quote.. I love these words, so inspiring! I played around with the words, deciding where I wanted them..
Then adhered them with foam pads to raise them off the card a little.. So here is my finished card..
and I’m sure it would brighten anyone’s day! I wanted to show you how cool the stamps look embossed in black too.. I used some zesty spring colours to offset the black, and added some words..
any ink you got on surrounding letters with a baby wipe before stamping! going through a tough time. Again I added some splatters of black paint to finish it off..
You will find lots more projects featuring our Visometry stamps HERE! Hi there! We hope you are enjoying all the wonderful inspiration we are sharing here on the blog today. Hello and I hope you all enjoyed a peaceful Easter day and are enjoying the bank holiday. We certainly did and it was so good to catch up with our family. Time to sit, relax and chat is so important. Today I am sharing my Monday Design Team inspiration for Visible Image. Mark will be appearing on Create and Craft TV this Saturday 22 April. The show is on at 10am (GMT) on Sky 674,Virgin 748 or Freeview 23 or you can watch it via the Create and Craft website here. I have set up my recorder in case I’m not around at 10am and will look forward to spotting my cards on TV! My teamies and I have been busy making samples for the show and my card today is one of my samples using the Life can be Tough word stamp together with the tree and leaves from the Create it set. These are 2 of the stamp sets which will be on the show. I made a background using Distress Oxides. I am having so much fun with these inks. Every single background is so unique and a perfect background for Visible Image stamps. I cut this down to make a 5 3/4″ by 5 3/4″ card background. I stamped and embossed the words and then added the little tree and leaves. I kept my card very CAS as I really think the background and sentiment says it all. I used this same sentiment a few weeks ago for a sympathy card for a friend of ours and it was very appreciated. However I also think that it works well for a card just to tell someone that you are thinking of them. Thanks so much for visiting me here today, and enjoy the week ahead. We will be back tomorrow with more inspiration! Hello and thank you so much for visiting our blog today! When I first saw the stamp I’m using today I thought… this one doesn’t really apply on me, I’m all about muted colors, not really bold colors. But I do have bold colored ink pads at home. So why not take them out again and use them? Don’t ever let yourself be guided by the first look… choose to see beyond. We have a beautiful card from Jane up next on the blog today. Hello! We are back with another awesome sample created for our Create and Craft TV show this Saturday! I hope you are having a relaxing and happy Easter weekend, and hopefully you’ll get a little time to play with your crafty stash !!! 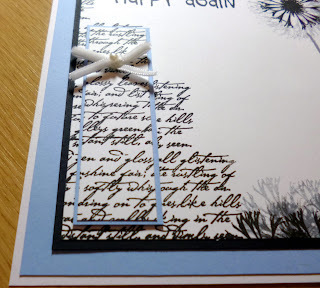 I have another of my creations to share with you today, using some superb Visible Image Stamps……. and it’s got pink in it too !!!! using a Versamark pad, and heat embossed with White Embossing Powder. 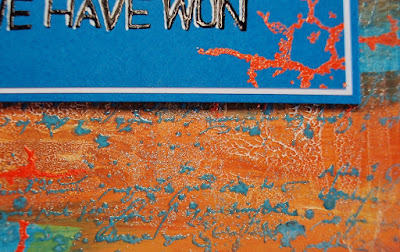 On a separate piece of card, using the sentiment stamp, I repeated the process. 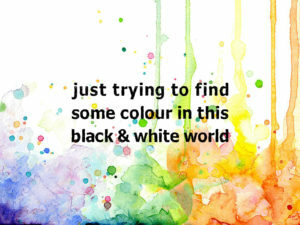 I coloured in the middle light bulb, and added Pink Stickles to ‘Colour’ in the sentiment. More gorgeous inspiration on it’s way later today when Veerle Moreels will be here sharing one of her wonderful show samples! Hi there, we hope you are having a lovely weekend. It is my turn to share some inspiration for Visible Image. A very dear friend died very suddenly a couple of weeks ago, and to say we were shocked was an understatement. kind of girl and I wanted to make something appropriate, without being too morose. I decided to use one of the new sentiments that Visible Image brought out in their latest release. It’s just perfect isn’t it? 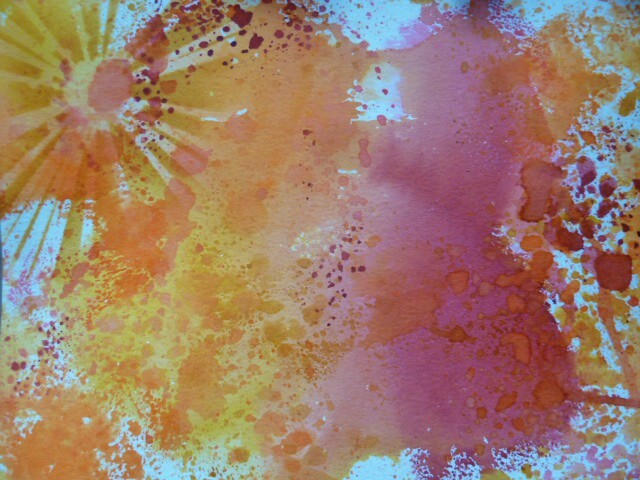 I also had a play with the amazing new Oxide inks….they are such fun. I also added Cracked Pistachio into the process. and built up layers of ink, adding water into the process too. 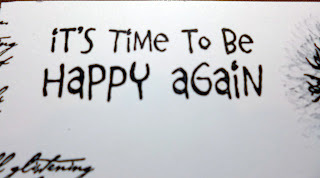 I wanted to keep my sentiment really simple so I added drew a border around the edge using a Micron Pen. It’s been ages since I have had time to draw one of these borders….very much my dear friend Joanne Fink’s inspiration. It added just enough pattern to my card to pull everything together. I coloured it with gel pens and added some white highlights. I added some shine to the border with a gel pen. 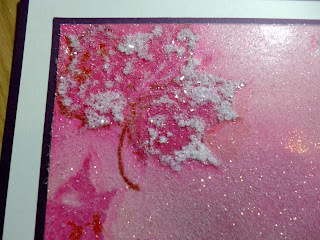 You can see in the background that I also stamped my flowers using the Oxide inks. Together with the script stamp it gives a very layered textured background. Here is one more shot.. Thanks so much for stopping by today. We should all try to live life for the moment. Remember to tell those you hold close how much you love them, every single day. 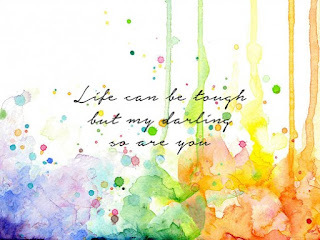 Life can be tough……but my darling so are you. Coming up next we have a fantastic matching card and ATC from Elina! Hello there! Firstly we have to apologise for neglecting our blog, and you, for the last few weeks! To say it has been busy would be an understatement.. there have just not been enough hours in the day and we have of course had to focus our time on the orders. We are really sorry that we haven’t shared the amazing inspiration our incredible Design Team have been creating.. but hopefully if you follow us on social media you will have seen some of their fabulous projects over the past few weeks. We have so many awesome quotes and sentiments, not only in our sets but as single stamps too, and we added some superb new quotes to this collection last month, which we aptly call ‘Express Yourself‘.. it includes quotes about creativity and colour, and heartfelt sentiments that can mean the world to someone going through a tough time. We know you will want and need many of them, and of course the fonts and designs by Mark are stunning! Black and White World is so much fun to play with! I’ve teamed the words up with some flowers from the ‘Create It’ set. This set has 11 pieces in it which can be used as extras on any card that you make. These flowers are fast becoming a favourite of mine… no doubt you will see them being used more and more! Especially as they have 3 different sizes on the stamp set. so it was easy to just colour with alcohol markers to make the word ‘pop’ that little bit more. Embossing powder when heat set is shiny – so it is easy to colour with anything with an alcohol base. Thank you Dot, we adore this card ♡ The interpretation of the quote is perfect! Coming up next is a fabulous card by Teresa Morgan. Hi there! Thank you so much for visiting our blog today. 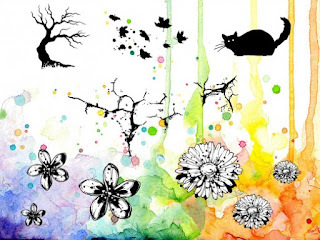 It’s my turn to share a project here at Visible Image and would like to share some Inktense Visble image love ^.^ I loved combining the Visible Image stamps together this way. And I tried out the inktense colorpencils for the very first time on this card. I’m pretty sure you will see more cards like these show up. Maybe even recognize part of it in my Christmas cards ( I really have to get started I know  ) But for now it’s this one…as we can never say “I love you” enough. 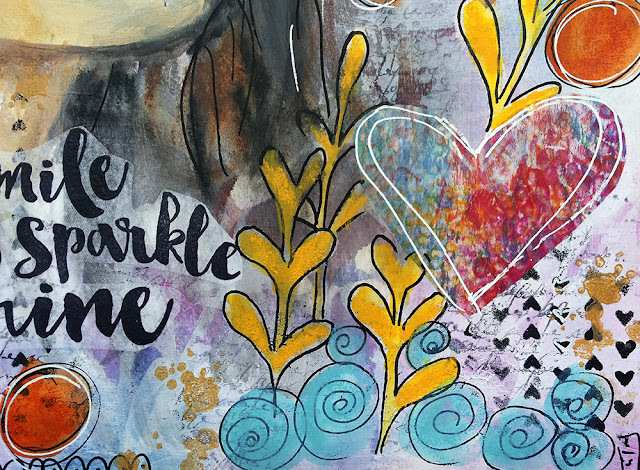 You will find more wonderful inspiration from Veerle over on her blog. Thanks again for visiting and we hope you will come back soon! Hello there! Thanks for coming to visit us! Books are the best travel companions. Whenever sitting on the plain or train I like to take out my book and start reading. Very often I soon realize that I have not taken a bookmark with me. Or if there already is a bookmark between the pages it’s often a piece of scrap paper, an old receipt or a worn-out ticket. I have hundreds of books, but only a handful of bookmarks. This needed to change. A good bookmark is not too small nor too large and most importantly not too thick. 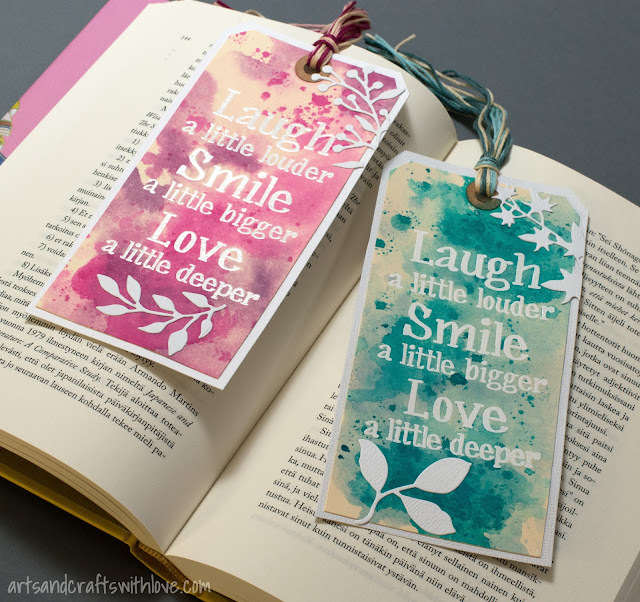 Stamping and die-cutting are perfect techniques for embellishing a bookmark as you can build interesting layers and yet keep the project thin. For stamping and colouring I recommend to use media that will be permanent and not mess up your book. You don’t want to colour the pages of your book with the bookmark! I trimmed few millimeters off from each side and glued the tag on a die-cut white size 8 tag, and finished the project with embellishing the tags with white die-cut leafs (small leafs are from Sizzix). Gorgeous project! Thank you Elina ♡ You’ll find more of Elina’s fabulous work over on her blog. We’ll be back soon with more awesome inspiration from our fabulous team. Hi there! Thanks for stopping by our blog today! All good things come to an end one day. One adventure ends and another one begins. Today it´s my last post for Visible Image stamps. The coolest stamps ever! For more Visible Image stamps visit the on line shop here. Wishing you all the very best for the future! We will be back soon with more of the latest projects from our amazing team. It’s good to be back, I took last Tuesday off, had one of those weeks of not enough hours in the day, days in the week ….. I’m sure we’ve all had them! 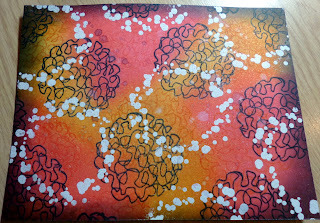 For my background I used oranges and blues dylusion inks. For all the stamps I used wow metallic golds and coppers and some little acorns acquired a while ago but never used until now, but perfect for this scene. Hope you like my make this week and to check out all the DT’s makes then make sure you’re a member of our Facebook group and follow our blog! 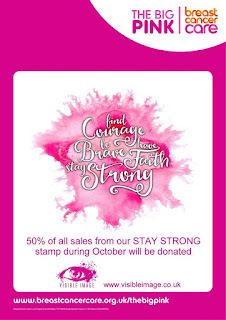 Our October Show & Tell is still PINK and if you hurry you can still enter, for all those who have and have purchased the Stay Strong stamp, then well done you and thank you for your contribution to a very worthwhile cause. I must announce my winner too of the giveaway from my Pink week blog…….. well done….. Thank you Suze! Such a gorgeous Autumnal card. We will be back tomorrow with more fabulous Visible Image stamps inspiration for you. 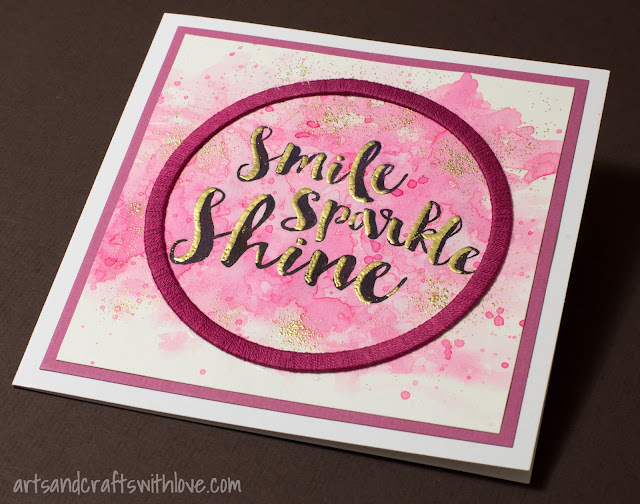 I used the awesome Smile Sparkle Shine and Drag & Drip stamps by Visible Image. Ooooh aren’t those colours and textures divine! We love Kim’s postcards 🙂 Thank you Kim! We’ll be back again with Kim Bacon’s latest Christmas inspiration very soon! 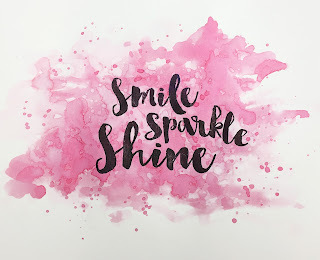 We are back to our PINK theme this evening and we have a sparkly pink number from Kim Robertson to share with you! This week sees the start of The Big Pink week all around the country in aid of the amazing Breast Cancer awareness campaigns all over the world. The Visible Image team have been no exception and have been creating some gorgeous pink cards and projects all week, with more to come! 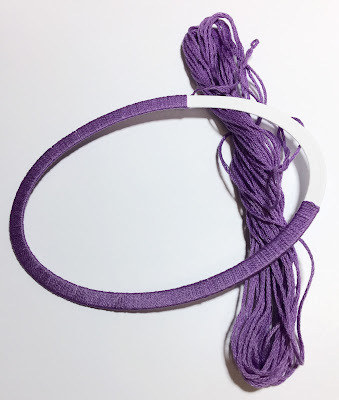 Culminating in a fabulous blog hop on Friday with a masssssssive prize (sneaky picture at the end of this post) to win from Mark and Helen at Visible Image and what a fun hop it will be too…. all will be revealed on Friday! 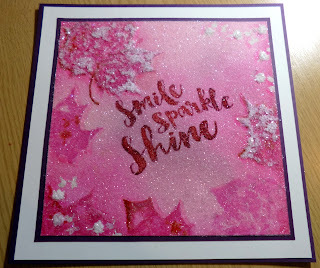 You know how much I love the Colours of the Wind set, and that beautiful big leaf, so I decided to use a couple of different distress inks in of course ‘pink’ tones, and do a background covered in sparkle with the Smile Sparkle Shine sentiment stamped onto the glitter, and brushed out using a damp paint brush. Here are some photos from along the way creating this one. I didn’t do a step by step for this stage as I have done something similar very recently with this stamp set, and how I ink and stamp tone on tone. I have also stamped out the little leaves in Versamark and embossed them in clear to start, so they work as a resist in the usual way. The larger leaf was of course stamped off the page and I used Picked Raspberry and Spun Sugar distress inks along with a tiny amount of Vintage Photo. I have also used some Raisin Adirondack ink too to add depth in the leaf detailing and, as I knew I wanted to cover this in glitter, some of the leaves would need to be quite dark to show through. 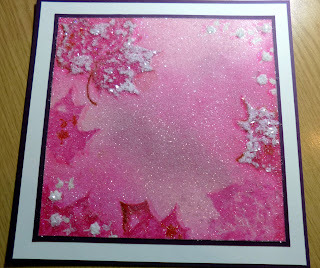 I covered the pink in a sticky sheet and made sure it was very smooth before tipping on some very sparkly clear glitter, I added a few mat and layers in white and plum card, I then went back in with the white glue and added another layer on certain parts of the leaves, so I could added some glass glitter for texture on the card too. In this photo the white glue is still drying and eventually the whole thing turned clear with incredible sparkle, but of course it never shows on camera. Those of you who met me this year at Ally Pally and did the Make and Take, or have seen my items on the amazing Visible Image stand at the shows, will know just how sparkly they are in person. Here is a close up of the glue drying with the second layer of glitter, you can just keep building the layers if you want a really rustic texture. 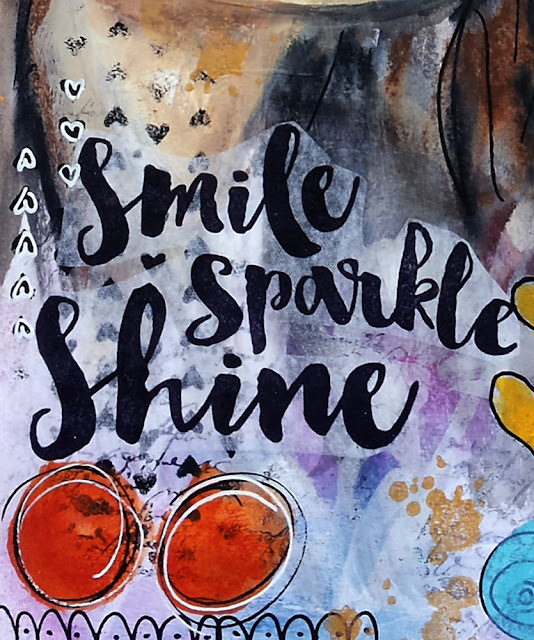 So next I inked up my Smile Sparkle Shine stamp with the same Raisin Adirondack which is still a water based ink, so I knew if it skipped in places I could water brush it out. Luckily the image came out, even though on glitter, perfectly with these amazing quality stamps although of course the higher parts on the glitter looked like it had little dots, so I used my water brush and just smoothed out the colour then left it to dry. 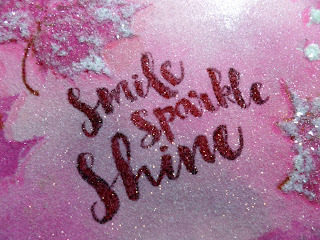 Once it was dry I took a Red Promarker in a nice rich deep tone and added just a few shadows to some of the letters, to make them look bright and vivid in colour, and the alcohol covers the glitter but allows it to sparkle too which looks so pretty. Here is what it looks like after that last stage. On the bottom right corner I decided to add the little breast cancer symbol in ribbon, and on top I added a little pink leaf and a sparkly pink gem. I also added those gems to the corners of the card too. Oh my goodness, there are characters, including a snowman… a car.. mixed media stamps… backgrounds… an Alien… sentiments and special verses too, something for absolutely every style of crafter wow wow wow!!! In fact there is over £100 pounds worth of stamps here which is wonderful, so be sure and have a go as you never know… Ooo I rhymed…!!! Best wishes to all and I will see you on Friday for the blog hop. 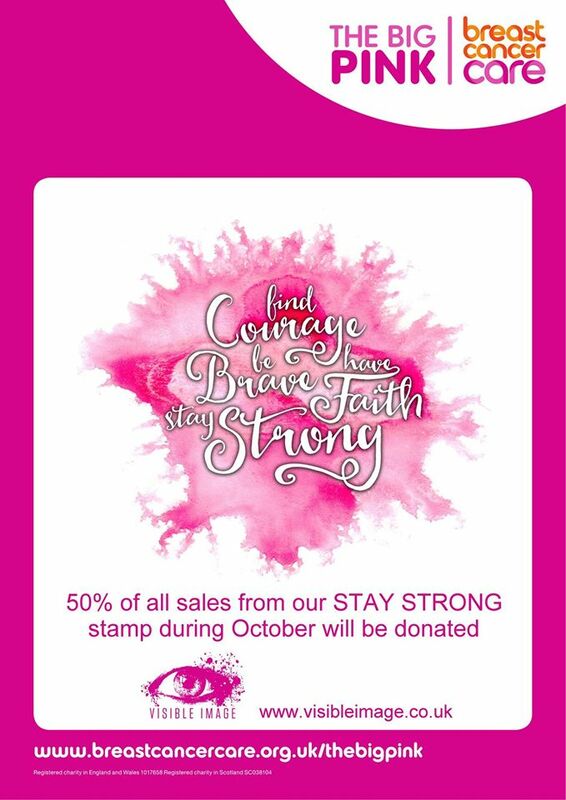 And thank you to everyone who has bought our Stay Strong stamp so far this month, helping us raise funds for Breast Cancer Care. We have raised £111 from sales of this stamp so far, and our grand total currently stands at £231 so thank you to everyone who has donated to this wonderful charity through our Just Giving Page. You can buy your STAY STRONG stamp HERE! We will be back tomorrow with some more gorgeous PINK inspiration from Teresa Morgan. Have yourself a relaxing evening! Good Evening and thank you for stopping by today! Hope Monday has been gentle with you! I simply adore the sentiment stamps that Visible Image design. Really different and the fonts they use are completely awesome!! They are perfect for that finishing touch to one of my famous Brusho backgrounds. If a job came up for a Background Designer then I would be the first to apply! So this one features the versatile swirl from the UNIVERSAL set. I painted the background and then used bleach with the swirl stamp. 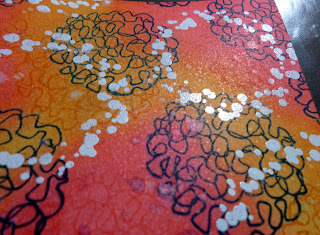 Once dry I then used clear embossing powder to add some shine. 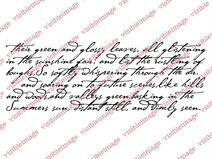 The sentiment was stamped onto a piece of the same painted card before the addition of the clear embossed swirls. So yes… if you have been wondering, our stamps can be used with bleach. And UTEE too! They are made of strong stuff. You can see just by looking at them that they are not just any clear stamp!!! 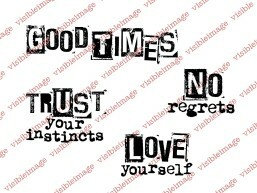 Have you checked out our amazing collection of inspirational quotes and must have words stamps? Come on over and have a browse HERE! We will see you tomorrow with Teresa Morgan’s latest inspiration. Good Evening! Hope you have had a great weekend. Kim Johnny is here with some more fantastic mail art created (of course) with some of our awesome stamps! Today I want to share a postcard for my weekly Visible Image creative make. The postcard is 4 inches by 6 inches and cut from Canson Mixed Media paper. I picked my go to soothing colors of Distress Ink, Cracked Pistachio and Mermaid Lagoon. 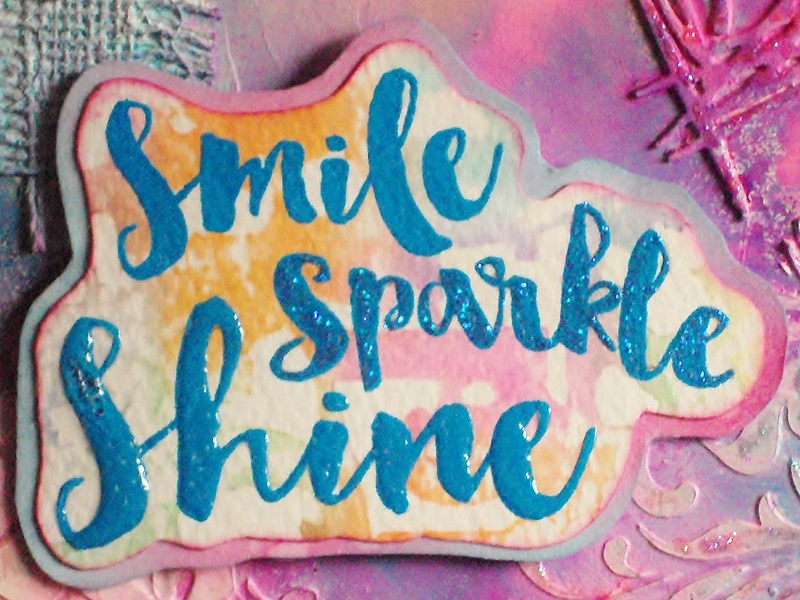 I added the happy bubbles with an ARTplorations stencil and DecoArt modeling paste. I adore the stem is a separate piece from the flower. The stem works great for any grungy touch needed 🙂 It is a fantastic set. I hope you have a fantastic week and can steal some time for creative play! We will be back tomorrow for another week or amazing inspiration here on the blog. Enjoy the last part of your weekend! Good Afternoon! We are back with more gorgeous inspiration for you this afternoon. Well it is Saturday again! I am back with some inspiration using the gorgeous Visible Image stamps. 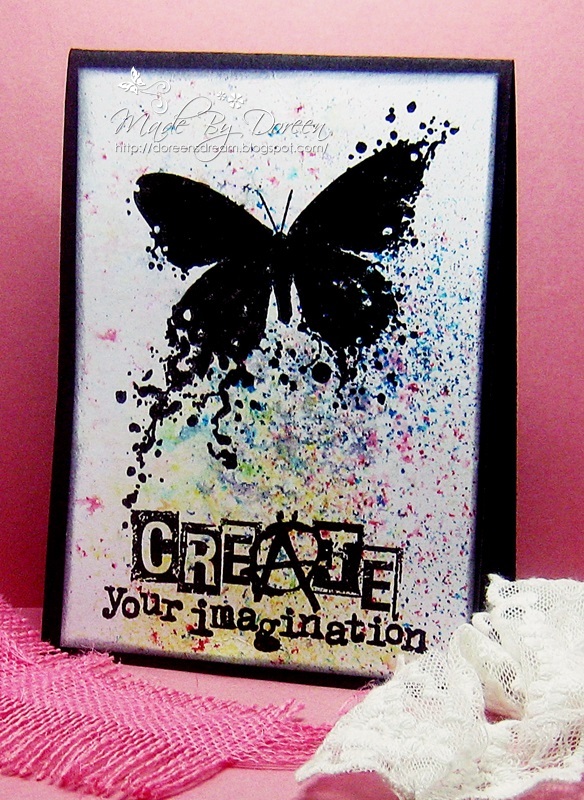 My image “Butterfly INKognito” has been stamped using distress inks onto some white card. I then stamped the ”Bronte Script” to add some dimension. 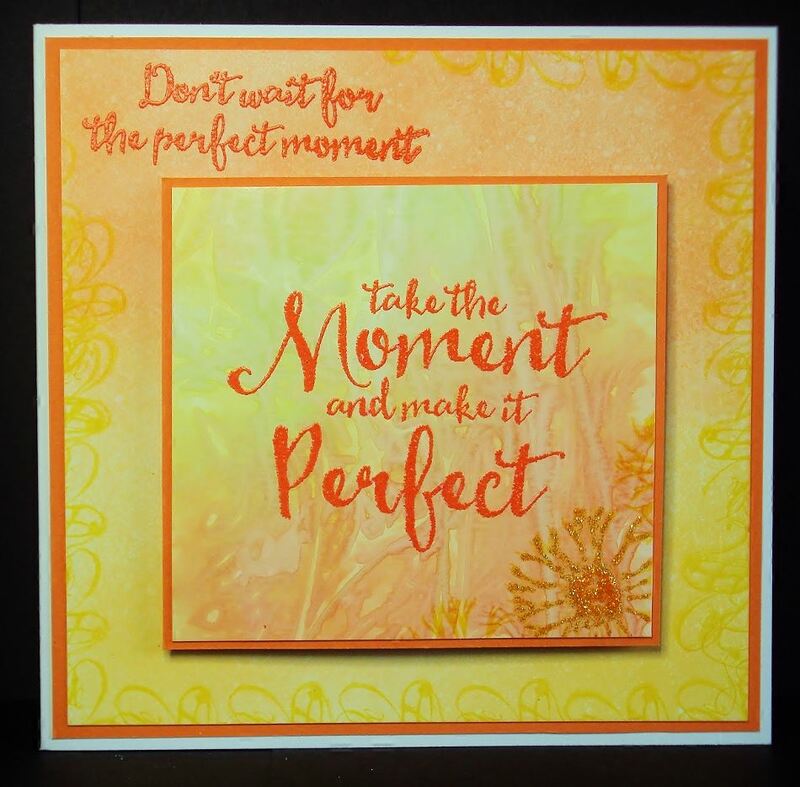 The sentiment, from the ”Sunshine Set”, was next to be stamped before splattering some distress ink all over the card and inking the edge. 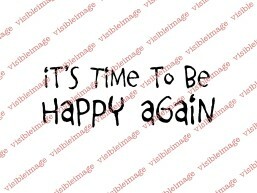 You will find this sentiment and many many more gorgeous words stamps over in our website shop. Enjoy the rest of your Saturday! 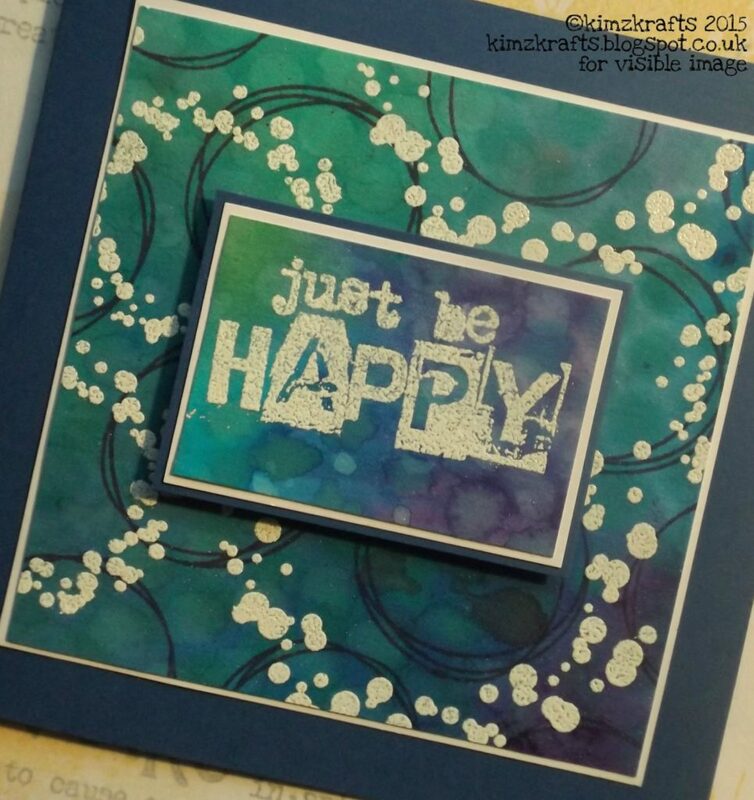 And don’t forget to show us what you have been creating with your Visible Image stamps for a chance to WIN some more in our monthly ‘Show & Tell’ challenge! Hello there 🙂 Thanks for coming to visit our blog today! 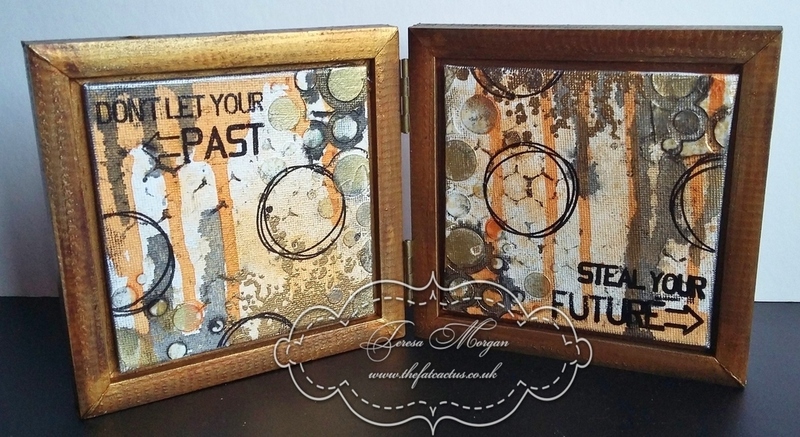 Double inspiration for you today with the latest projects from Susanne Rose and Doreen OBrien. It’s my day today to share some inspiration with the super unique Visible Image Stamps. I used the awesome “You Are Loved” sentiment to create a chalkboard card. I used the DCWV DIY Project Stack Chalk Party. 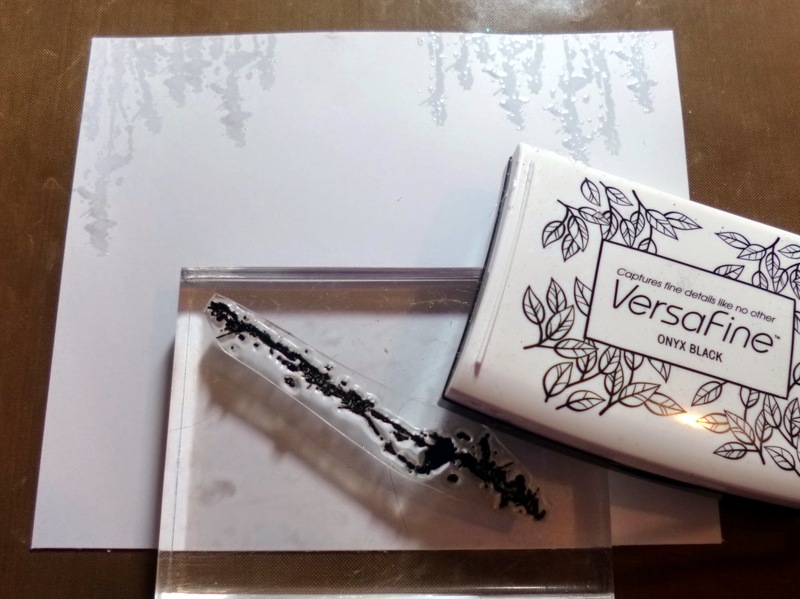 The black paper is perfect for stamping with white pigment ink. This is a really quick card. 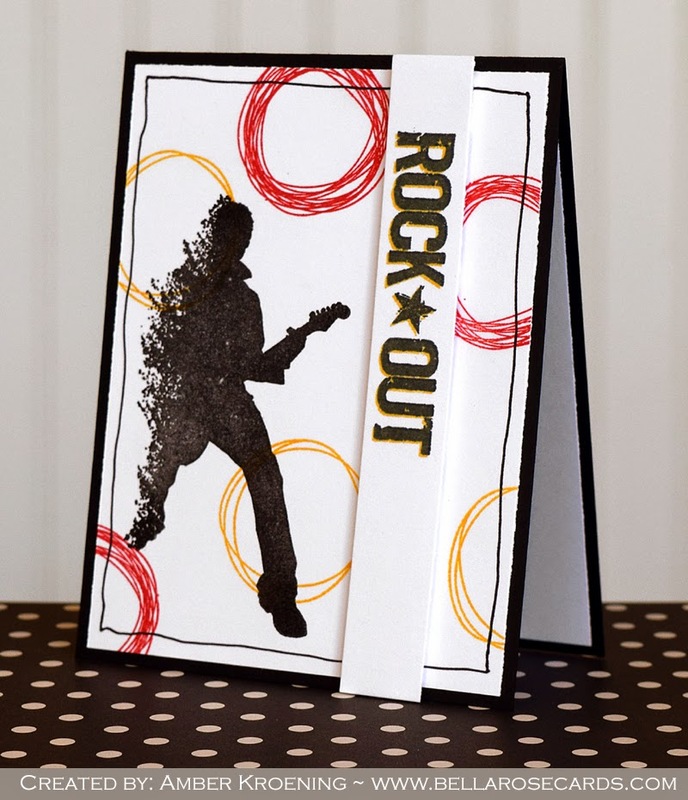 The base layer is embossed with a Sizzix embossing folder. I sanded the paper so you can see the white core on the embossed parts. I adhered every layer with 3d foam pads to get some dimension. See you next time, Susanne. If you want to read Susanne’s post in German, head over to her blog HERE! You will find all our amazing stamps HERE in our website shop! Unique designs. Superior quality clear photopolymer stamps that can be used with pretty much anything.. from bleach to UTEE! We hope you will come back later to see Doreen’s beautiful new card. 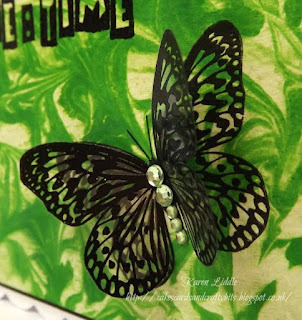 We are back with more fabulous inspiration for you, as promised, here on the Visible Image stamps blog! 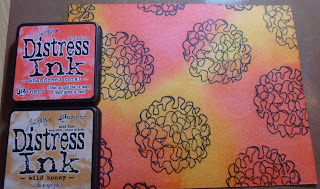 Today I’m sharing two cards I made for my Inky Workshop in August, using some fabulous unique Visible image Stamps. 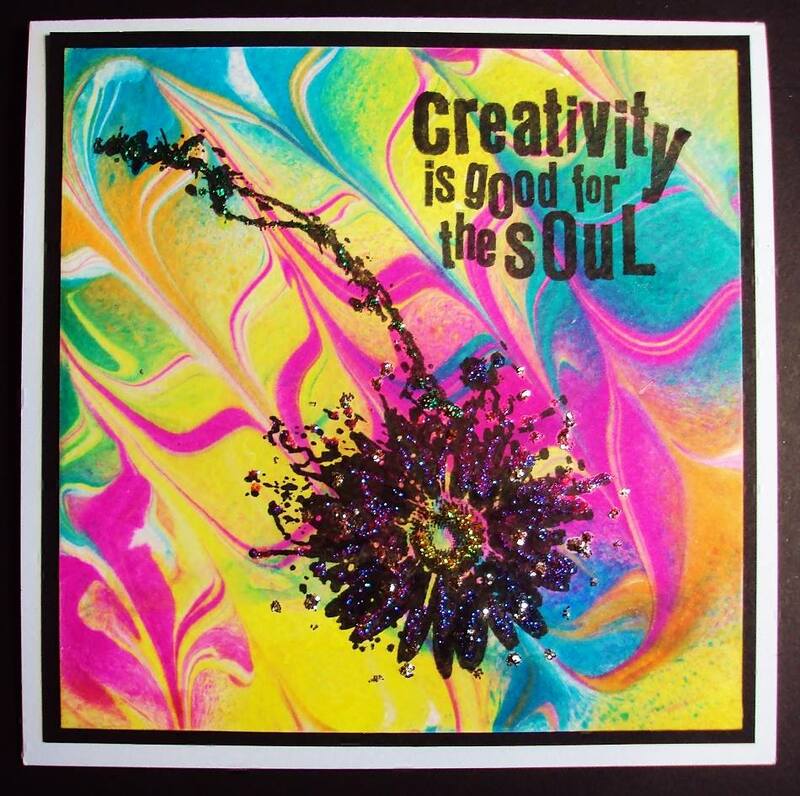 And the stamps here are…..
‘Creativity is good for the soul’ from the Make me Smile Set and Flower INKognito. 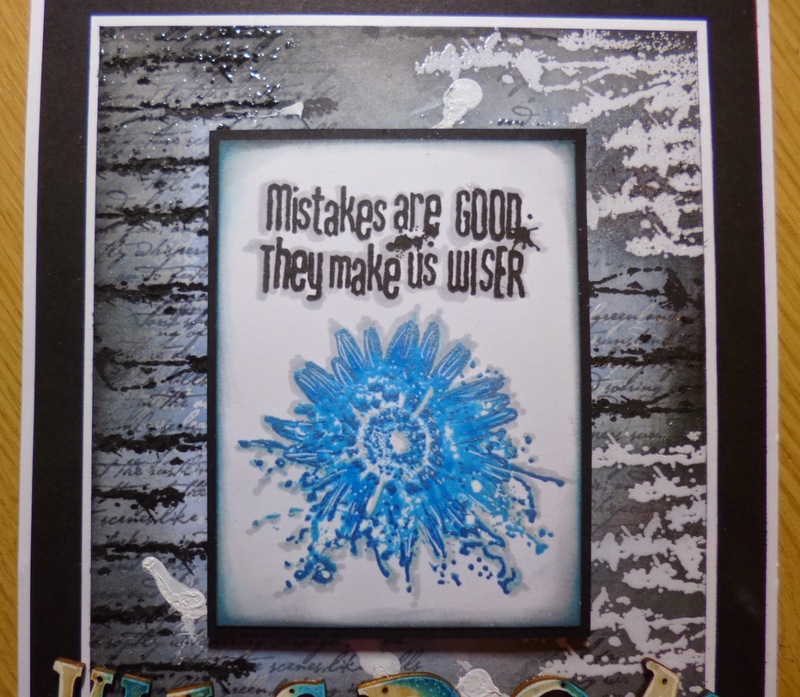 Both cards were made using the same ingredients, shaving foam and Dylusion ink sprays for the backgrounds, and the images and sentiments were stamped using Black Versafine ink, and coloured and highlighted with Stickles. Plenty of time to get your entries into the ‘SHOW & TELL‘ challenge this month, just make sure you use only Visible Image Stamps for a chance to win some yummy stamps. Take a look at the Visible image Facebook Group, for inspiration, and a place for you to display your creations, using their fantastic stamps. Saturday September 12th at Pink Tulip Creations in Studley, please contact Sheila on 01527 852052 for more details. Saturday September 19th at St. Budeaux Baptist Church, Plymouth, please email me [email protected] or PM me on Facebook for more details. Sunday October 25th, Warwick, please email me [email protected] or PM me on Facebook for more details. Wowza! Loving all that colour and what superb backgrounds! 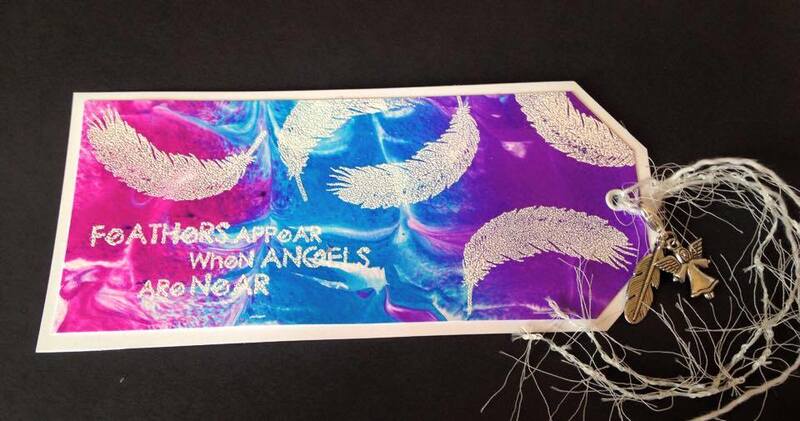 So much fun to be had playing with shaving foam and inks… go on give it a go! And if you can make it to one of Pauline’s fabulous inky workshops you will love every second! We will be back tomorrow with more awesome cards and projects from our very talented team. Hello 🙂 Thank you for coming to check out today’s inspiration. Today I have two lovey CAS-cards for Visible Image. First one is made with ink from ink pad stippled through a stencil, and then I’ve stamped the beautiful sentense Stay Strong in black on top. The second card is made by brushing water on a water color paper and then add some color from spray mists by dripping and brushing it on. Let it dry complete and then stamp the words on top with black. I’ve used the new You are Loved, and I really love the bold fond on this one. Have you seen our NEW Express Yourself collection yet? You will find them all HERE! 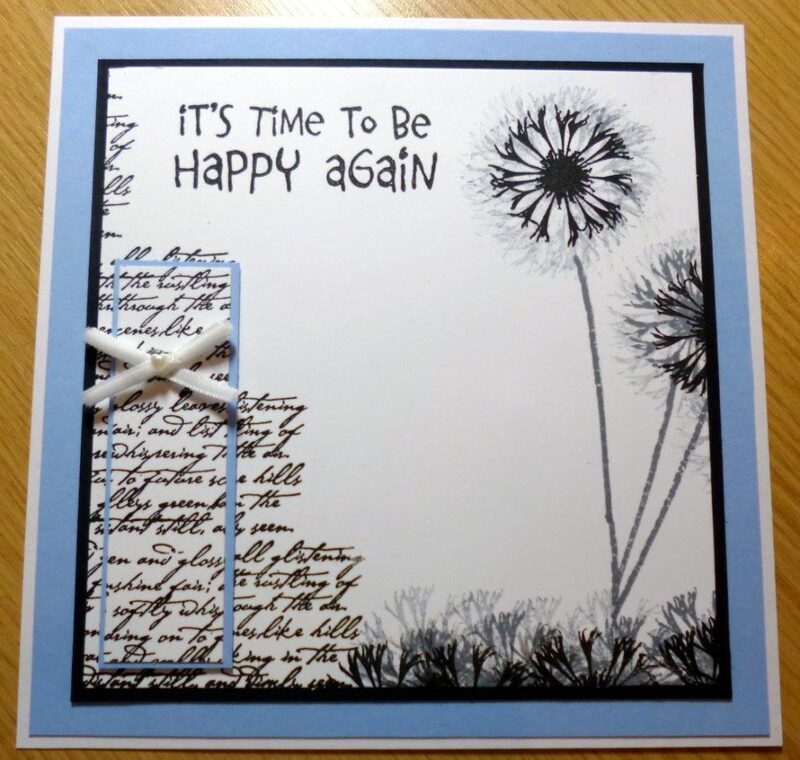 We will be back soon with a step by step tutorial from Kim Robertson using one of these NEW sentiment stamps. Hello 🙂 We are back with more awesome inspiration for you this evening. I have a mixed media postcard today. I am having so much fun with mail art! Hope you like it! This is the front side of the card. I started with some plain white mixed media paper. I cut a bunch of pieces to 4 inches by 6 inches. Then I made puddles of Americana Multi Surface Satin paints on my craft mat, spritzed with water and smooshed the paper into the paints. Lots of painty play. The nicest thing, once the paint is dry, it is very easy to stamp onto the background. 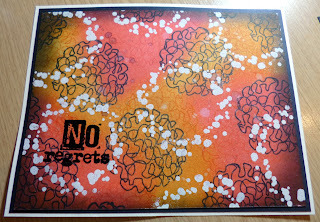 The front side uses the awesome Vision INKognito and sentiment Love Yourself from the No Regrets set. Both are heat embossed with Distress Ink and Ranger Superfine powder. This is the backside of the postcard. For the text and address divider I used the stem from Flower INKognito. 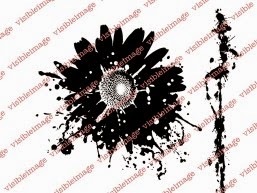 The amazing splats are found in the Ink Splats set. All are stamped with Distress Ink and heat embossed with Ranger Super fine, black powder. I added some fine paintbrush spatters with Black DecoArt Media Fluid Acrylic paint. More spatters the better in my mind anyways! I glued the front and back together with Americana Decou-page Paper collage medium. It dries quickly and non-tacky. Once done I inked all the edges and my fingers with Jet Black Archival ink. So are you ready to play and get inky?? Inspiration from the Design Team on the Visible Image Blog, HERECome and JOIN the Facebook Group where you can enter our ‘Show & Tell Challenge’ for your chance to WIN some awesome Visible Image stamps! Wow! Awesome work from Kim… loving the mail art. If you missed Kim’s previous mail art post, you’ll find it HERE. And you can find lots more of Kim’s work over on her blog. We will be back shortly with a superb trio of cards from Suze! Good Afternoon 🙂 Thank you for coming to check out today’s inspiration here on the Visible Image blog. Hi Guys n Gals How are y’all? My DT day for the fantastic Visible Image, the BESTEST stamps EVER! Simple and bordered by white and turquoise for that added POP! To enter our monthly challenge click HERE for all the details and win some fab stamps! 🙂 You gotta be in it to win it! Gorgeous card.. those colours are divine! Have you got your hands on this awesome stamp yet? Good Evening! Hope you have had a good start to the new week. Oh what a glorious weekend it has been! Sun, sea and sand by the bucket load, thank you Mr Weather! Today I am showcasing a collection of cards I made using only Visible Image stamps. I wanted to make a group of cards suitable to be given as a gift set and so I set about making several background papers first. In my palette there was a lot of blue/green/purple Brusho paint which needed using up. I looked in my envelope drawer and found some blue envelopes which were the right size for my plans. I don’t often use white embossing powder but with the intense colour of the background paper I ended up with it seemed the perfect one to use. For those that know how good Visible Image stamps are I don’t need to tell you how deeply etched they are, how perfectly they stamp every time and just what fab designs there are! For those of you who are new to Visible Image, er, just re-read the above! As I said, I started by making the background papers. 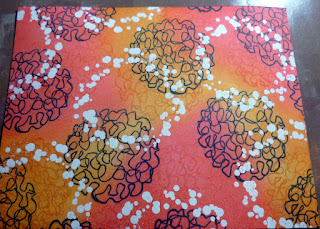 I had great fun smooshing colour over some good quality white card stock. I use Brusho powder as a wet paint and just leave it to dry. Next I used a dark blue ink to add the circles from the Universal set all over but not overlapping. 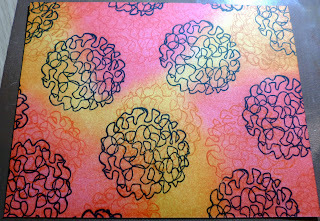 Once this was completely dry I started adding the white embossed dotty-circles, again from the Universal set and also the larger one from the Plasma set. 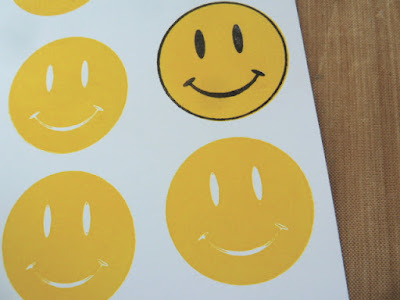 The sentiments, which are from the Express Yourself range, were stamped onto card with none of the extra stamping on. It allows the words to stand while still being a perfect colour match. All the elements were cut and mounted onto white card before being added to the blue card bases. 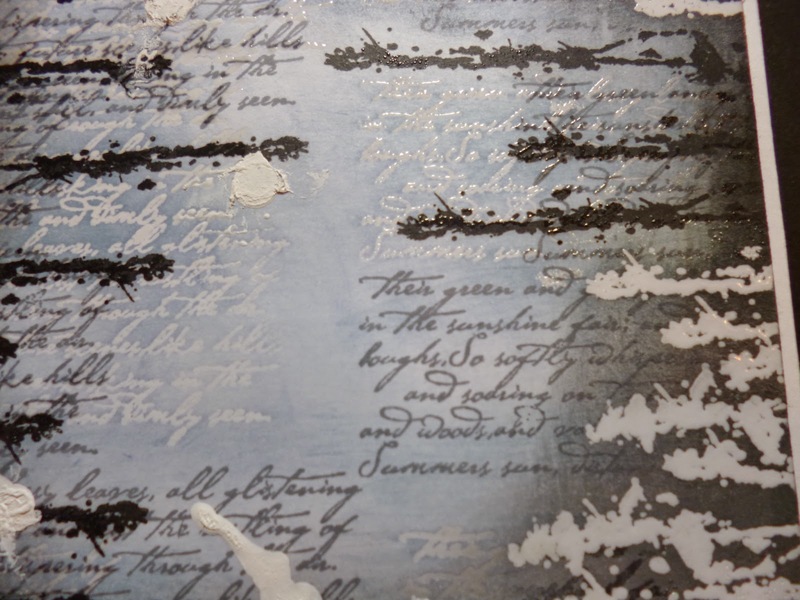 The sentiment pieces were mounted using a dimensional glue to raise them from the page. I know this is a stamp heavy project, but if you have these sets not only do you get great value for money, but you can also create a huge number of projects using different combinations of the stamps! Loving these cards! So inspirational and Kim’s backgrounds are awesome! You’ll find all our NEW Releases HERE! Including our stunning Christmas stamps and more brilliant words. 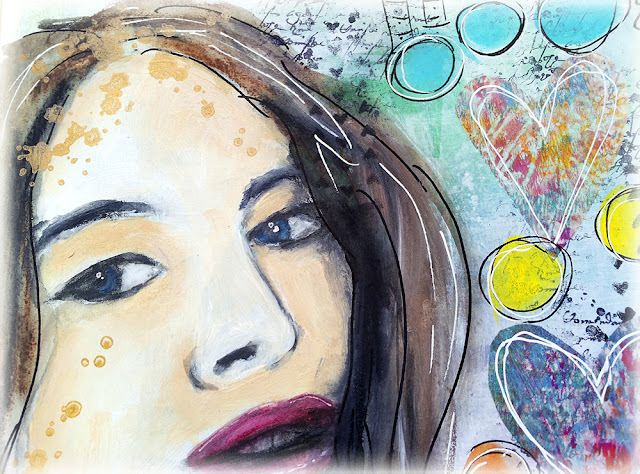 Today I am sharing the small canvas I made for my Visible Image Inspiration day! I hope you like it. 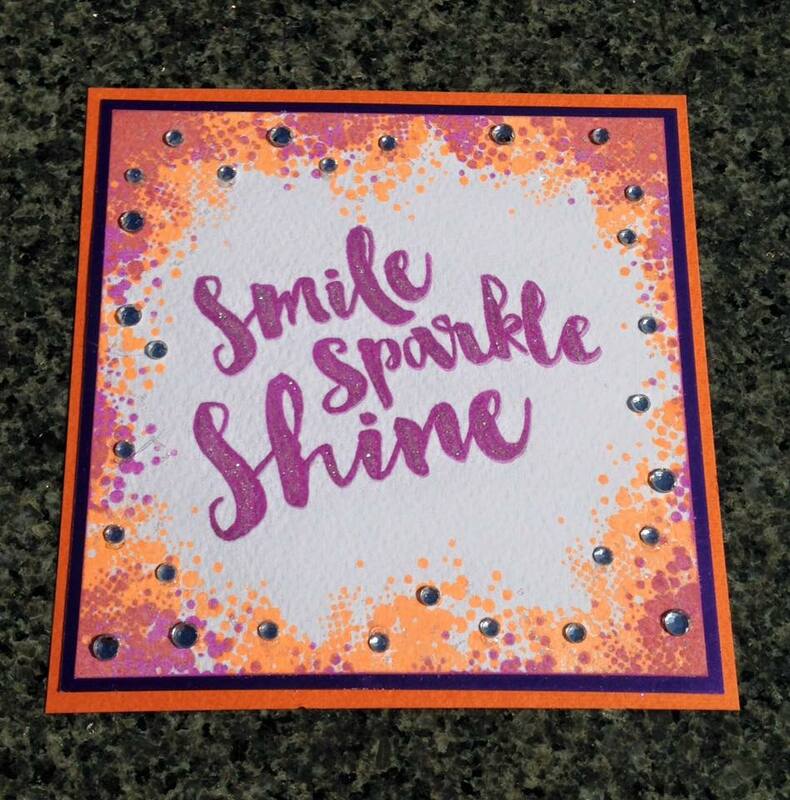 I am fortunate to have this fabulous stamp, “Smile Sparkle, Shine” to play with, thank you so much Helen & Mark! The stamp is a wonderful size and is so smooth, it makes stamping and embossing a dream! My canvas is 5 inches by 7 inches, so you can see the stamp is a perfect size for it! I think my love for modelling paste and crackle paste shines through in this piece! 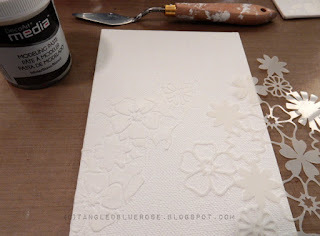 The base flowers are made from an ARTplorations stencil, Bloom Factory applied with DecoArt modelling paste. I got carried away with the next layers of DecoArt acrylics and crackle and did not do step by steps, sorry 🙂 ! The sentiment is stamped with Distress Embossing Ink and heat embossed in Recollections Copper. Love the shine it has! 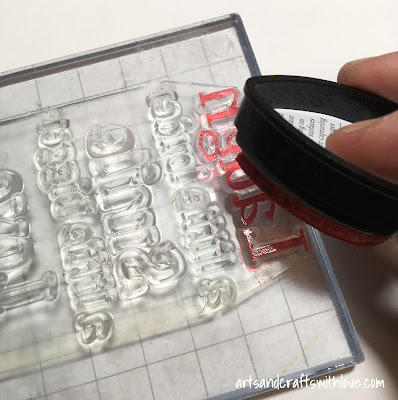 This embossing powder works really well with strong shapes. I made the flowers and spritzed them with Distress Spray Stain, Antiqued Bronze. 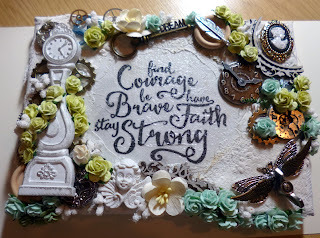 The diecuts are assorted Sizzix, Tonic Studios and Tim Holtz. Have a wonderful day! I hope you can make time this week to play and share in the Visible Image Facebook Group, love to see you there! 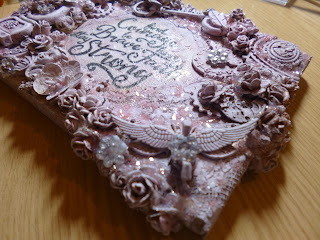 Susanne Rose will be here next, with an awesome mixed media tag! On to today’s inspiration. Lisa Nygards has been busy creating with our NEW Express Yourself stamps this week. The results are stunning.. Since colors are so fun to play with, I can’t stop with just one card. 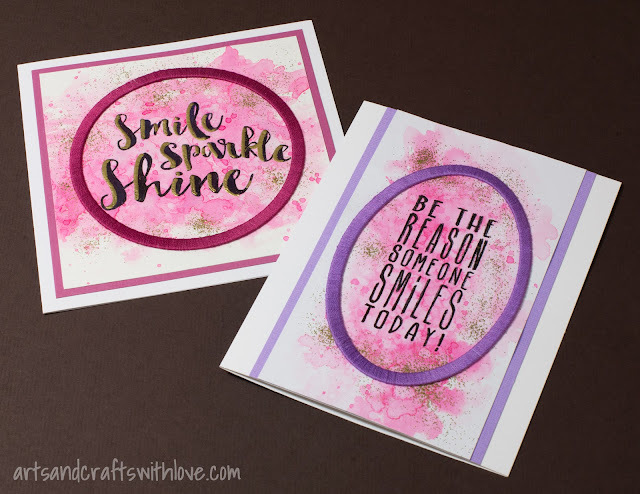 The new sentiments are so perfect for stamping on a colorful background. I’ve played with different kinds of mist colors, but not the regular way (misting). I’ve wet the paper (watercolor paper) and then dripped and wiggled the color around. Dripped some more color, dried it, dripped some water on it and more color and another round until I liked it. It can’t be wrong, let the colors guide you! Then the best part, to find a sentiment that match up with what I’ve created. Now I have several lovely new ones from Visible Image to play with so it became three cards today! 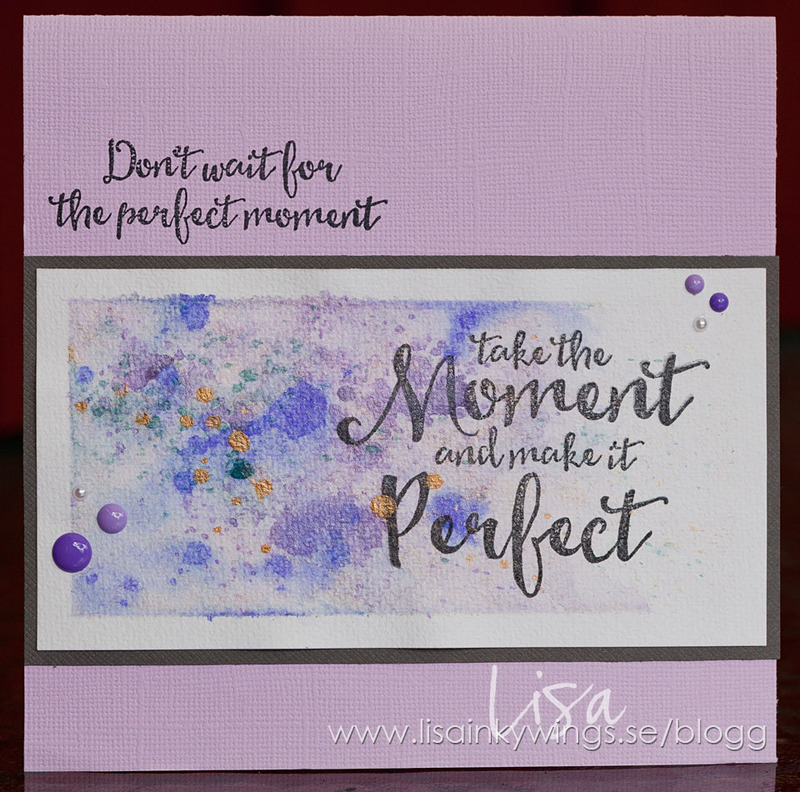 The sentiments used: Lilac card: Take the moment. Brown/Blue card: A best friend. Green card:Stay Strong. 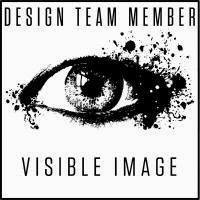 You will find all the amazing Visible Image Design Team inspiration here on the BLOG. Come and JOIN the Facebook Group where you can enter our ‘Show & Tell Challenge‘ for your chance to WIN some awesome Visible Image stamps! And don’t forget to LIKE the Visible Image FACEBOOK PAGE too. 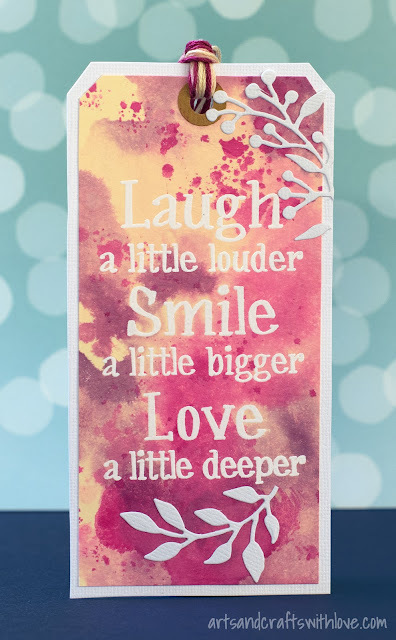 Three absolutely gorgeous cards from Lisa… love the watercolour backgrounds, and sometimes words are all you need. You’ll find more of Lisa’s inspiring work over on her blog. We will be back tomorrow with Teresa and her Terrific Thursday post! It’s Time To Wake Up And Be Awesome! 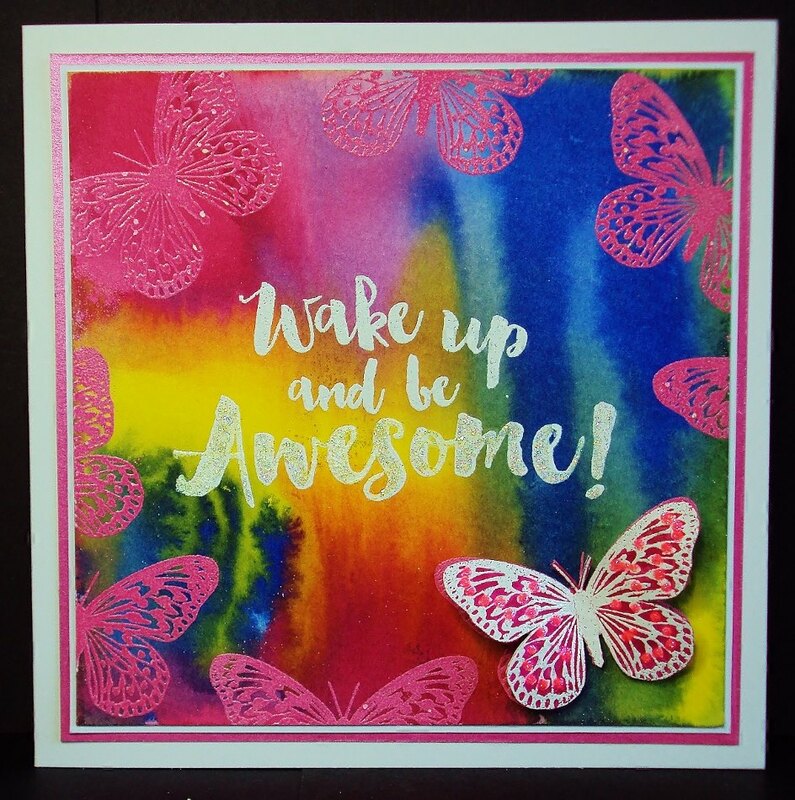 We have more awesome inspiration for you this evening from Doreen OBrien and Karen Liddle who have both been creating with our NEW Express Yourself sentiments. Loving this monochrome effect from Doreen! I used the ‘Bleeding Tissue’ technique for the centre of this card.. 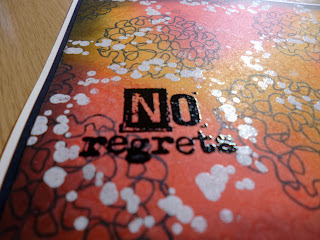 I then over stamped with a stamp from the Ink Splats set, love these. I used a couple of different sized tops, pressed into the ink pad, for the circles. Finished off with a little bit of distressing round the edges. Fabulous card from Karen.. loving that background! Isn’t our inky bird awesome! Good Evening! Hope you had a great weekend and Monday has been gentle with you! I love the new stamps of the Visible Image June Release. 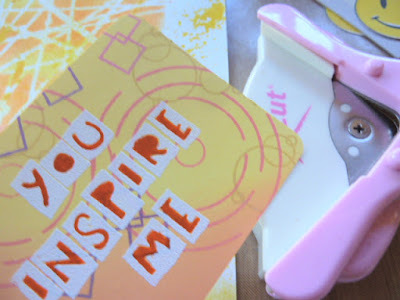 They are super modern and perfect for my passion: mixed media and art journaling! I used the Marabu mixed media spray inks for the background layer. I really like them, ’cause they are waterproof and I can work on top with my Neocolor II pastels or other watersolubal colors. I used the script stamp from the Revolution set from Visible Image to create more interest on the background. 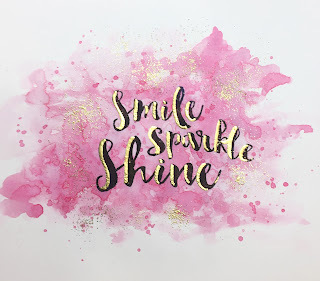 Smile Sparkle Shine! 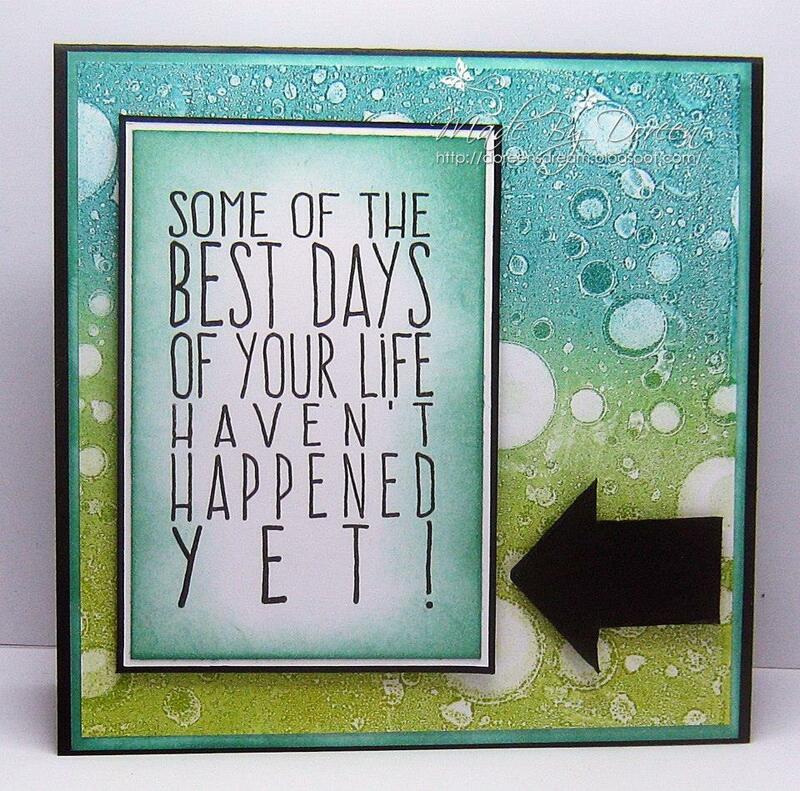 This is one of the new awesome sentiment stamps from Visible Image. I stamped it onto tissue paper with jet black Archival Ink and embossed it immediately with clear embossing powder. The black will be much more saturated with the embossing on top. The sentiment was adhered with gel medium. The hearts are cut out of a gelli printed deli paper. I use it to wipe of my brayer during a gelli printing session. I lay the deli paper on top of a stenicl and wipe the brayer off. 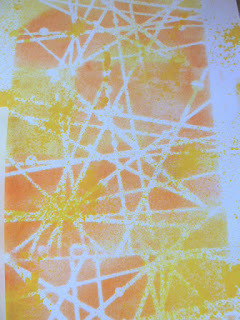 So I get nice and interesting texturse plus a clean brayer. Deli paper is perfect for collage. It’s thin but not as delicate as tissue paper. I adhere it with Gel Medium. I also used some of the Ink Splats background stamps from Visible Image on top of the woman’s face. You’ll find more of Susanne’s brilliant work over on her blog. Good Evening! Hope you’ve had a good start to the week. Hello! And welcome to the start of another week!! 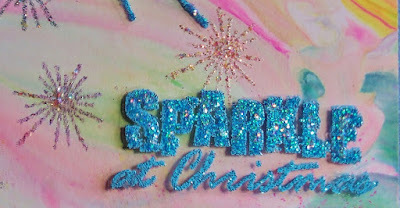 As you know I am totally addicted to Brusho Paints, and the card for today is another example of what you can achieve. 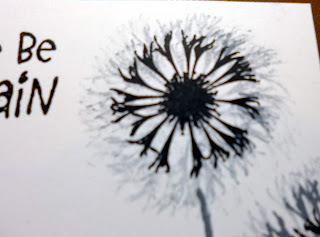 I have used one of my favourite Visible Image stamps, the Gerbera from the INKognito range. 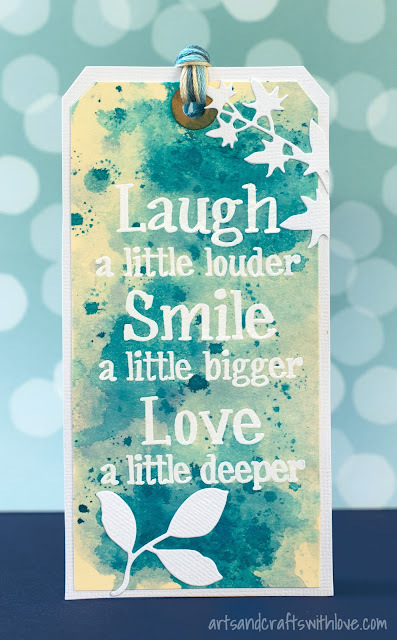 I first created the background using turquoise and lime green paints before stamping the flower and the sentiment from the new Express Yourself range using white embossing powder. What a beautiful card. Our Flower INKognito looks amazing embossed in white, especially on those gorgeous colours! Positive words for someone who needs a little bit of reassurance. You can find more of Kim’s work over on her blog. Good Evening! Hope you have had a great Saturday! Another week has passed and it is Saturday again which means I am back with some inspiration using the gorgeous Visible Image stamps. You can find more of Doreen’s fabulous work over on her blog. We’ll be back shortly with Susanne’s Saturday post! On to today’s business… It’s Wednesday which means the fabulous Kim Robertson is here to inspire you! How are you all? I hope everyone is doing ok and enjoying a little sunshine and warmth. 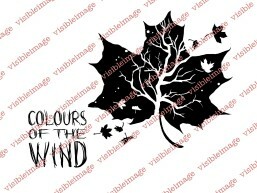 I have another card from the fab Visible Image’s new launch of stamps and I really hope you like it.. I went for the clean look again on this one. Well ish… for me anyway haha! But I love the spring out with the old, fresh start vibe to this one. I started with a square of white card and black archival ink. I stamped the Bronte Border stamp several times in ascending order on the left side . I then initially stamped my flower head and blotted a lot of the ink off the flower stamp and went around the edge of the flower head again using just the tips of the flower very pale just enough to cast this shadow effect. The fabulous sentiment from the new launch , so crisp and clean stamps like a dream some polymer stamps can be too squishy I know you know what I mean haha so that if you press too hard the image blurs and does not look clean anymore, never so with Visible Image. They are an absolutely spot on image. So using the flower head still I used grey inks and black and the tips of the flower to create this 2nd and 3rd generation stamping border which has the impression of movement on the card. 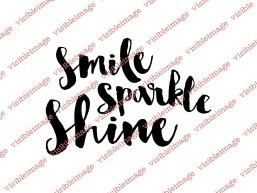 I hope you managed to see all the fabulous new sentiment and phrase stamps launched recently from Mark and Helen with Visible Image, they are just adorable and I cant wait to get my hands on all of them There simply is something for everyone and every occasion. Take a look if you haven’t seen them yet here on the new launch page. Ok friends I hope you all have a wonderful Wednesday and I look forward to seeing you here again next Wednesday. What a beautiful card… love the blue and cream combo. Perfect card for someone who’s had a rough time of it and are ready to come out the other side. Have you got your hands on some of our NEW Express Yourself quotes and sentiments yet? Whether making cards is your passion or mixed media is more your thing, we have the perfect words for your projects! You will find them all HERE. As you probably know… Our stamps are gorgeously thick, beautifully clear, and so deeply etched that you will always get perfectly stamped words and images.. unless of course you are intentionally going for a more distressed look with your project! They are made with the finest photopolymer available, and every stamp is still hand cut by Mark! Our designs are unique, original and different… we love to stand out from the crowd. We do it our way… and you seem to love it 😉 So thank you! Good Evening, thanks for coming to visit us here on the Visible Image blog. I used Aquatints to create the background for this one, on watercolour card. 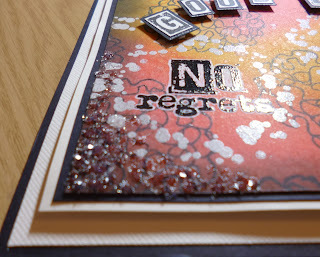 This background was created by stamping in Versamark, heat embossing with clear embossing powder, then blending inks over. I did this 2 or 3 times creating layers. Love these cards… the clockwork heart works brilliantly with our INKognito heart for a really different look! Gorgeous background on the second card too… I think we could all use some ‘ME Time’ and it makes me want to sit in a sunny meadow full of gorgeous flowers 🙂 Thanks Karen! 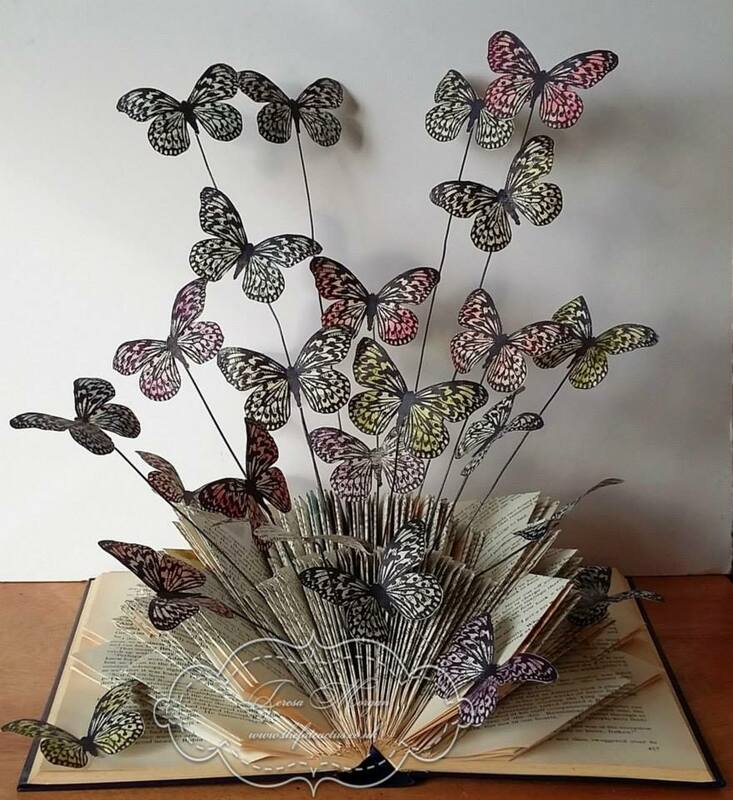 You can find more of Karen’s fab work over on her blog. Hi There 🙂 Thanks for visiting our blog today! We are catching up with all the latest Design Team inspiration today. Well this is going to be my last live blog Post for a few weeks. We are moving house and I am having to pack away my craft room. I will still have scheduled posts to share though. 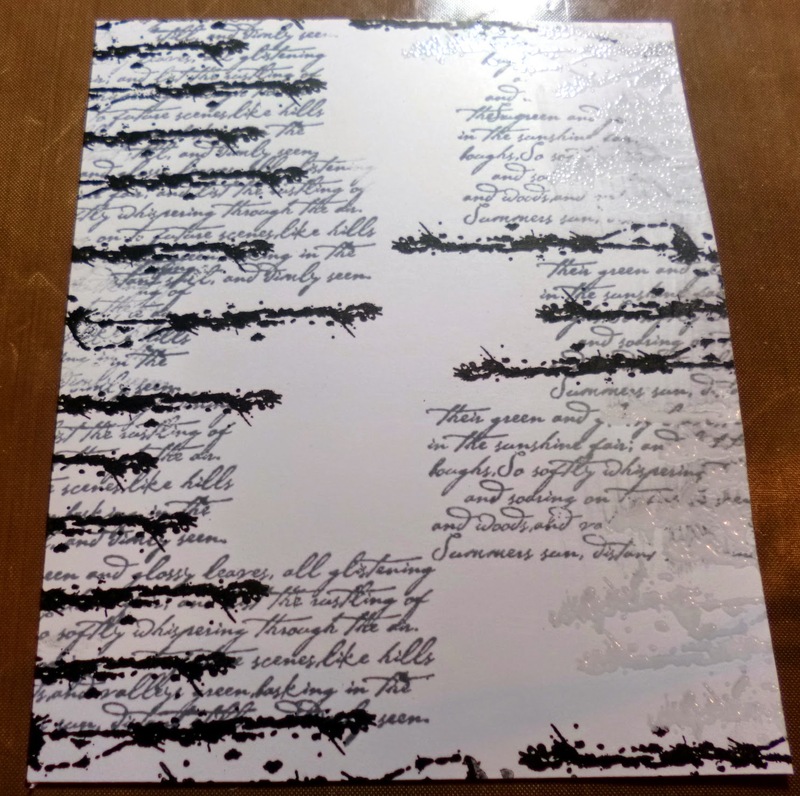 I have a Mixed Media canvas to share today, I first painted my canvas with acrylic paints, then using Archival black ink stamped some background stamps “Grunge Harlequin” and “Bronte Script”.My heart was cut out of some card, I painted this and grunged it up a bit with a black pen. I then stuck this to the canvas with some PVA glue . You’ll find more of Doreen’s wonderful work over on her blog. Good Evening 🙂 As promised we are back with more fabulous inspiration this evening. Oh what a memorable weekend I have just had, a few big things achieved! Yesterday was a momentous day for us as we launched our ‘new’ boat. Beautiful little boat and I know she is going to give us some very happy days out. Right, need to get on with the business in hand which is my inspirational project for my DT. 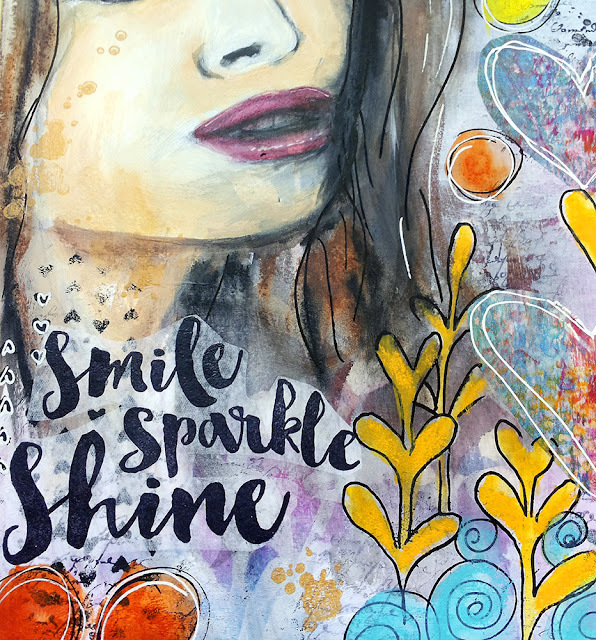 Last week saw the launch of a new set of stamps from Visible Image and I have used one of the Express Yourself stamps as the cover sentiment for one of my little books. This book has blank pages in so it could be used for little quotes but you could equally make a book to hold photos, addresses, or just as a shopping list. I also used the small butterfly because I love this stamp! Here are the links to the stamps I used. We love Kim’s little books and they are always admired on our show stands 🙂 This would make a lovely gift, especially with these beautiful words. Have you ordered your NEW stamps yet? You’ll find all our NEW releases HERE! We’ll be back tomorrow with Soozie Tuesday with Sue Joseph 🙂Enjoy your evening. If you have missed any of our previous posts you will find them HERE! One of our stunning NEW stamps is rather special… Beautiful, positive words for anyone going through a tough time in their life. 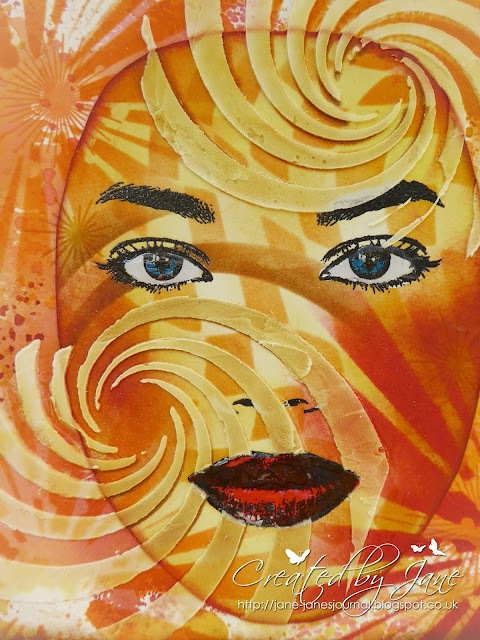 Kim Robertson has created a stunning canvas which would make such a wonderful gift. 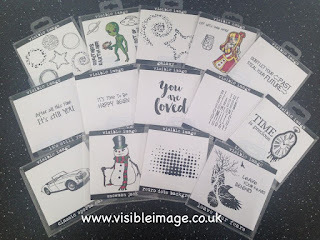 Well today I have an extra post for the fabulous Visible Image this week as they have a huge new launch day with new characters, and lots of new sentiments and really thought provoking phrases that are just not covered by any other team. I just love the individualism and combination of a fabulous artist/creator and an ingenious Poet and wordsmith /media specialist in fact Helen and Mark are the opitomy of Jack and Jill of all trades, and I am sure they won’t mind me sharing that with you all. I created a Mixed media canvas which I would like to share with you all and I hope you love it as much as I do. I realise it is quite hard to pick up on the shabby chic sort of colourway but it is actually pale pinks chalky whites brown and gold in all the recesses I used the stamping on 1 ply of tissue to get the image transferred to the canvas method for this one coating it in PVA glue to hold it on to the surface and over the entire thing to protect it. 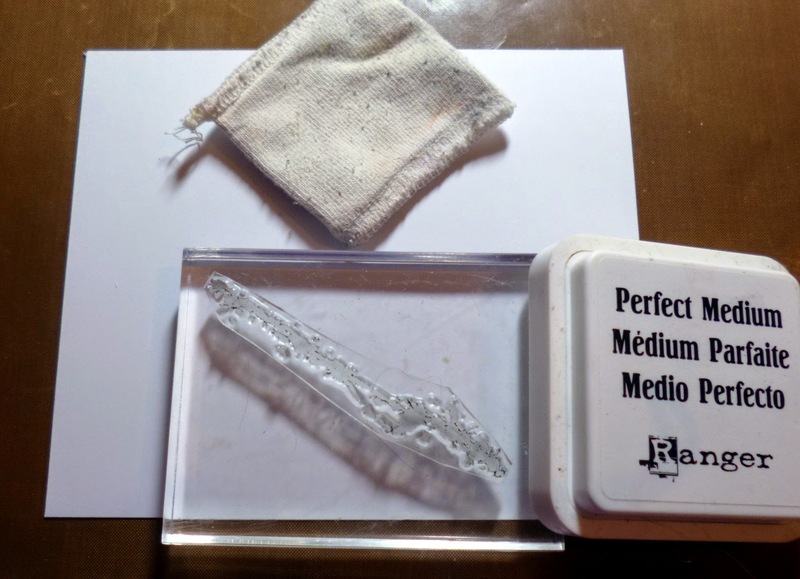 It will wrinkle and bubble but that’s ok just leave it be to dry as it flattens itself out as it does. I prepped my canvas then by adding a thick layer very roughly of texture Crackle paste around the sentiment in a frame shape, I heat dried it til it cracked then I added some hessian in places and also some cheese cloth and I dried that layer. I then took a stencil and ran some Grunge paste through the shapes which were splots dots , stripe , zigzag in a grungy pattern in random areas. dried again then began adding all the goodies. After I had done that I started adding all my items to the canvas and here is a picture of all the items attached before all the colouring started. You can see all the items in their original colours and what they all are here with mixes of gold and silver , green and turquoise flowers and how I built up the winged dragonfly in the bottom right corner. I covered the whole thing except of course the main show in the centre which I shielded with card cut to size. To start I covered everything in Gesso in fact I did a few coats not only for opaque coverage but also for texture as some place I stippled the medium on rather than painting it will smooth brushstrokes. After the gesso I went in with a vintage chalk acyclic paint in a pinky/lilac cool tone and covered everything then added several spritzes of colours in browns/golds/mauve’s to the mix and dried in between each coat with a heat gun. Here is that same corner finished with all its glitter. I did not do a complete tutorial of every step as a piece like this is done in several steps and can be rushed but I am a perfectionist it seems lol, but if you would like one please just let me know in the comments. I strongly advise a hot glue gun though for a piece like this as it will take longer having to wait for every part to set. Here is the top right corner , I had some chipboard frames that were oval so I cut a piece of the frame and added that to the canvas then I found a little plastic cameo button , very ugly and cheapy looking lol so I made her beautiful with an old stone like texture. I really just keep adding til I have a balance to the canvas and so it looks complete without being over the top. Some may say it is if you like the minimal look but I do enjoy this style and you get to use up small left overs and such like. Here is the finished piece again and I truly hope you will have a go or we can do a series on how too or some thing like it.. The stamp I used for this one.. I absolutely love it. Anyway I hope you will go look at all the hard work put in by all for this launch and the amazing goodies made by a fab team HERE! Love to all as always from my house to yours. Isn’t this such a special project from Kim, I know a few people who would appreciate receiving something like this right now, as I’m sure you do too. 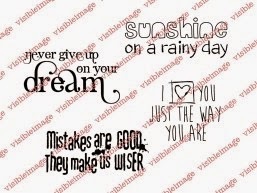 I am sharing another one of the newly released Express Yourself Stamps from Visible Image. I have just matted and layered this onto some white card that I inked up with some distress ink, using the same colour that I used to make my background.I made my background on my Geli Plate. Fabulous card from Doreen using these fantastic words as the focal point, you don’t need much more with these stunning new stamps! 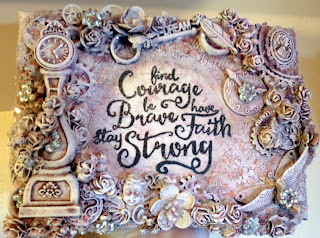 Come back later when Kim Robertson will be here inspiring you with how she created her stunning canvas featuring our very special new stamp called ‘Stay Strong’. Good Morning! 🙂 We are so excited to be releasing SIXTEEN brand new sentiment stamps TODAY! 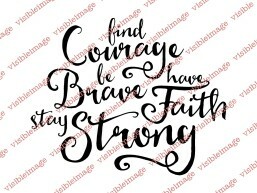 We’re adding to our existing collection of fantastic quotes and sentiments, in stunning fonts, perfect for mixed media projects, journaling, card making and more. We’ll be sharing more of their stunning samples with you tomorrow. If you love to colour and create with character stamps, check out our NEW character stamps release HERE! A late post from us this evening after a very long day! Lots of new customers who only discovered our stamps today too! 🙂 Looking forward to being back in Doncaster in October. Tomorrow we will be catching up with all the latest Design Team inspiration from Susanne, Doreen, Kim J and Karen 🙂 And of course Kim Bacon’s Marvellous Monday post too! A great one for journaling hey! And a brilliant design from Mark! This stamp will be available to order on June 12th. This coming week there’ll be a chance to WIN some of our NEW stamps over in our Facebook Event, so come and join us there too! Hope to see you here later on if you are still awake!!! Good Evening 🙂 We hope you have had a fabulous Friday, and you have something nice planned for the weekend! 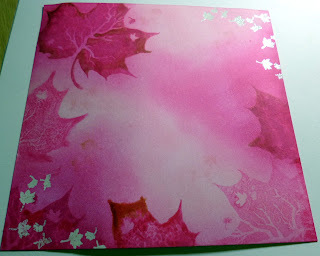 Today I’m sharing a card I’ve made, using some fabulous Visible Image Stamps, a very simple card really. I made a background using Brusho’s, I liked it so much I didn’t want to cover it all, lol, I bet you’ve all done that too !!!! 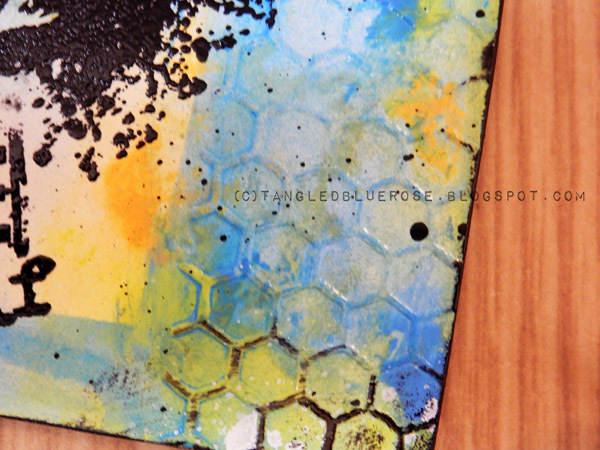 I used the Brusho’s on water-colour card, I spritzed the card with water, then sprinkled 3 colours on top, Blue, Yellow and Orange, spritzing to make them run into each other, it gave this cloudy day look. On a smaller piece of water-colour card, using similar colours of Distress ink, I mixed each colour with a small amount of water, and washed them over the card, adding more colour where I needed it. Grunge Flourish, Classic Face and ‘Never give up on your Dream’ from the Sunshine Set. I stamped the curly bit of the Grunge Flourish a few times to the left on the larger coloured background, stamped the sentiment using Versamark, and heat embossed in Orange powder. Then on the smaller piece of coloured card, I stamped the Classic Face using Black Versafine ink. Using thick bleach and a small paintbrush, I bleached the colour out of the eye, then added some blue and orange to the iris, when it was dry I added Glossy Accents, for a shiny eye. I coloured her lips with a ‘Ripe Persimmon’ Distress ink wash and to finish off I added orange Stickles to the flourish, for that bit of sparkle. Time to get your imagination going, pick up your inks and Visible Image Stamps, and enter the ‘Show and Tell’, for a chance to win some new Stamps, details HERE. Go have a look at the Visible Image Facebook Group HERE, there’s always a buzz going on, and Helen is showing sneaky peeks of the new stamps, being released very soon, exciting stuff. 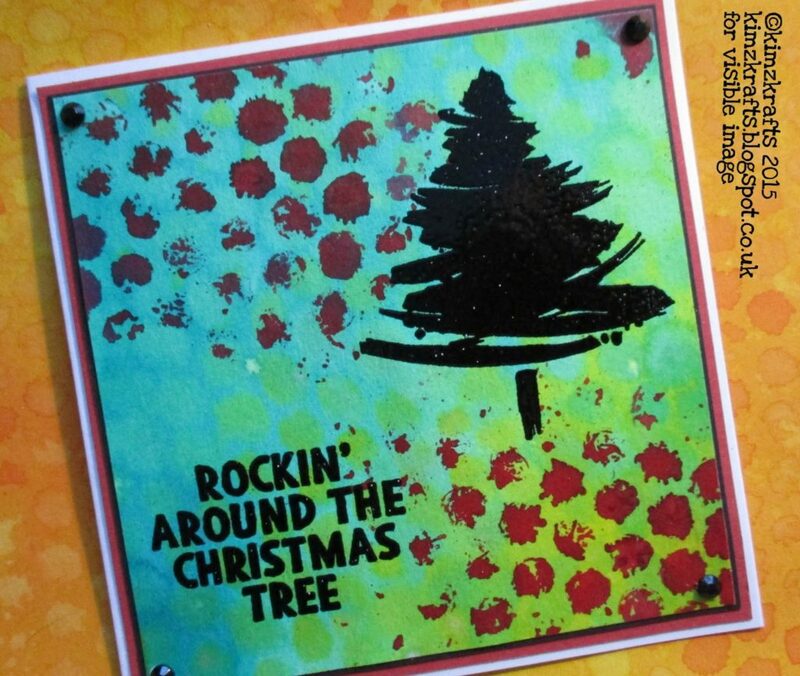 we will be playing with Bleeding Art Tissue, Alcohol Inks, and Distress inks, along with Stamps and Stencils. LOVE this! Such a striking card! Gorgeous colours and the perfect sentiment! And tomorrow, NEW Design Team members Susanne Rose and Doreen OBrien will be here to inspire you! Hello 🙂 Thank you for coming to visit us here today! What a truly Marvellous Monday it is today! And what a truly marvellous weekend it was for me! I hope you have arrived here on this fantastic Monday with as many happy thoughts as I have? So, on to my inspirational piece for my DT using some amazing Visible Image stamps. 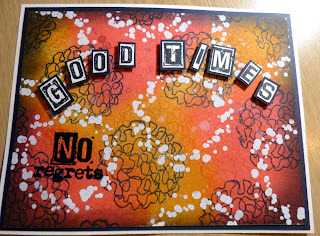 Here I have used the popular INKognito flower stamp as my feature image and the Good Times quote from the Express Yourself range. These sentiments are really versatile and guess what? Rumour has it there are some new ones coming out soon to add to the collection. But you didn’t hear it from me! I started by creating the back ground. I used Brusho paints, followed by some water stamping using the script stamp from the Revolution set. Then when this was dry I dry brushed over it all with Gesso. Then came some grey ink stamping with the same script stamp. It is very much a unique and unrepeatable effect although similar pieces can be created. Another reason to make more than you need for each project! The flower, stem and sentiment are stamped using white embossing powder. I added some eyelets and placed the finished images onto some green card which had been stamped with the script using pale green ink for a subtle effect. You will find all the latest inspiration on the Blog Homepage. Come and JOIN the Facebook Group where you can enter our ‘Show & Tell Challenge‘ for your chance to WIN some awesome Visible Image stamps! And don’t forget to LIKE the Visible Image FACEBOOK PAGE too! You can also sign up to the Newsletter HEREHave a great evening! Today I wanted to give a feminine touch to something that is predominantly masculine! 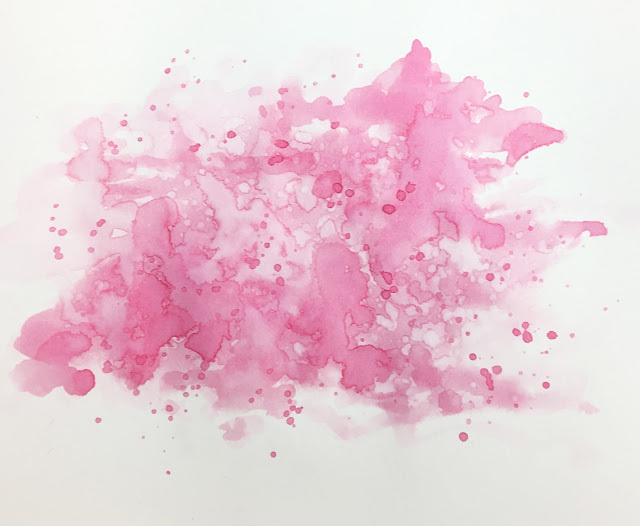 For my background I used pickled raspberry, spun sugar and salty ocean distress ink, sprayed with water, added random water droplets and flicked with white linen dylusions ink spray. A great twist on some masculine stamps Suze! LOVE our Vintage Car in PINK! You’ll find more of Sue’s awesome work over on her blog. Hello There 🙂 Thank you so much for visiting our blog today! Today I have another fun Visible Image card to share. I started by stamping my background with versamark. 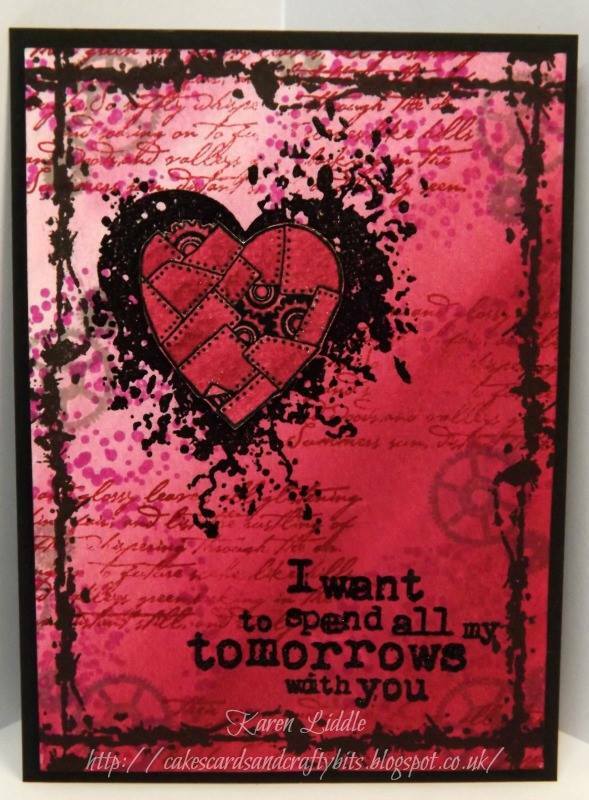 I stamped the sentiment in black, and stamped the heart in versamark on a separate piece of cardstock, and cut it out. I added three little pearls and adhered my card front to a black card base. Don’t forget to join in on our April Show and Tell challenge! And for more Visible Image inspiration check out the Facebook group, and Blog homepage. I hope you all had a wonderful Easter and got to see family etc.. Maybe enjoyed a little chocolate egg or two hehe! Isn’t the sunshine soooo good to see, it was so cold and windy last week and now the sun is ablaze, our weather really is soooo indecisive but now it’s just not sure haha… but I will happily take a few more days like today with the big old blazing yellow ball in the sky. Without further waffling I have a card I made for Visible Image today and I love the contrast between grey,black and white and the bright blue of the Inkognito flower… See what you think lovelies. Something a little different , still in keeping with my style of background though I think. What do you think, Is it me? 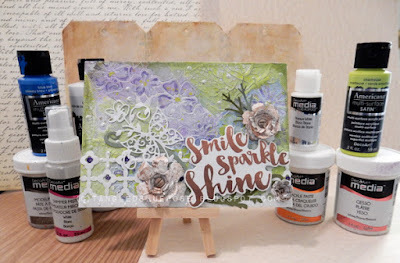 Ok I have a full step by step for you today so lets get started , I hope you will get out a piece of scrap white card and a few stamps and join in with me to practise your backgrounds too. I took my anti static bag and ran it over some white card first. 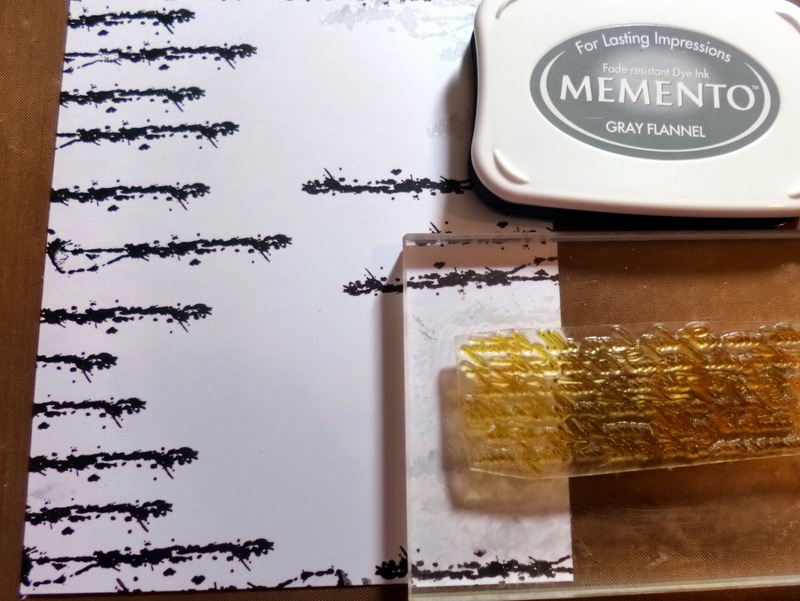 I then took the long stem stamp from the Inkognito flower set and with Perfect medium stamped a few random size images all differing heights and embossed them in clear embossing powder. You can see the few embossed pieces we just created at the top of the white card here. 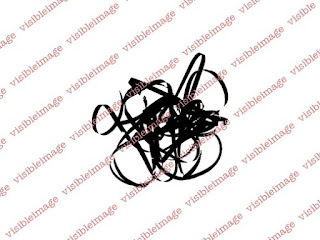 Next take the same stamp and use Versafine Black archival ink and again randomly stamp images on the paper coming in from the sides again in varying heights. You can see the last stamping we did does not have to be perfect It will all come together. Next take some grey ink and the Bronte Border backing stamp and begin randomly stamping this also coming in from the sides . This is what we have so far, at this stage wipe off any ink from the heated and set embossing as it will stay wet on the embossed areas which is now resisting the colour. I also added another layer of bronte border clear embossing but over top of the black to add another layer in dimension on the backing. 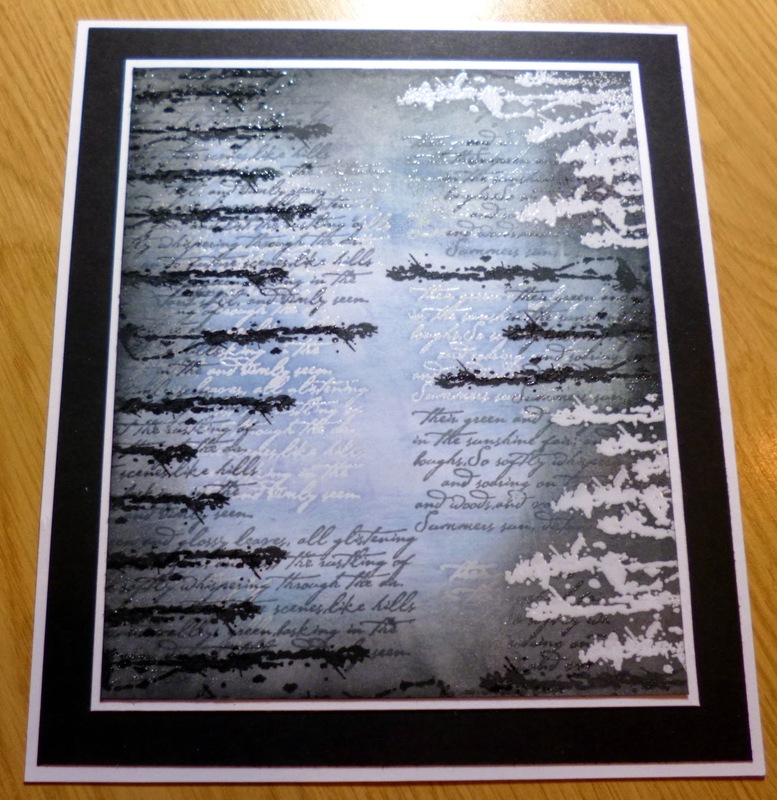 Here you can see it now has a very slight grey/blue hint I achieved this by using black soot distress ink on the very edges and bringing in just a tiny touch of Stormy sky Distress ink too to slightly tint the card. Right up to this stage I knew I wanted the backing grey/white/black but I had not decided what colour the flower would be I just knew I wanted a bright colour to really stand out of the grey/black backing. I added the backing piece now complete to a white mat then a black layer and then another white mat and set aside. 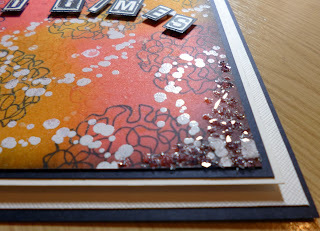 Here is a section which I zoomed in on so you can try to see the layers in the stamping. I stamped my INKognito Flower in Salty ocean distress with a little stormy sky on the outer petals and then I went in with a white gel pen for the highlight etc and the blue stardust sparkle for the outlines on the petals . I also went around the flower with a very light grey Promarker to lift it off the page with a shadow. I also stamped my stamp from the Sunshine sentiment set. I cut this all out and again inked the edges. 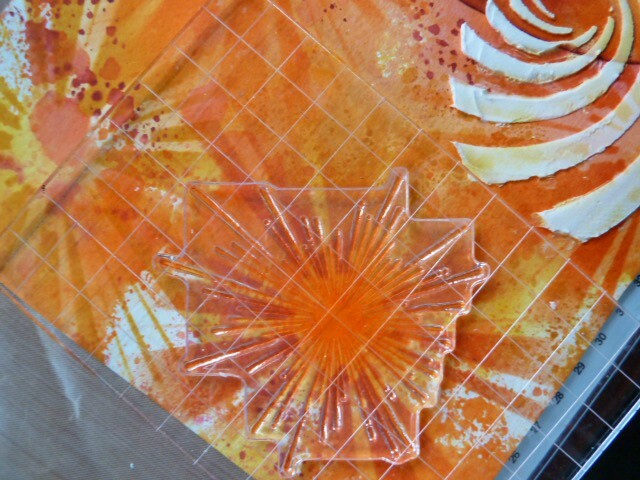 Here is the centre piece completed and edged to draw your eye into the picture. The flower is very sparkly and metallic but this light just does not do it justice I am afraid. I took some wooden letters which are around and Inch tall and inked them to match just on one side I also went around the letters and filled in the outline of each in white. and to finish off I simply took a dry cloth and polished the surface of the metallic inks in the flower and the shine on the embossing to make it get really shiny and have that almost water look about it. Here you can see the letters really well. The gorgeous sentiment comes from the Sunshine Set, and I stamped it in the black archival and heat set. I quickly went round the very edge in grey Promarker just as I did the flower image too to pull it forward with a little shadow. Here are the sets I used today..
Well I hope you like today’s card using the fabulous Visible Image stamp sets I know I really enjoy them and they really fire up my imagination . Have a wonderful day ladies … and gents. You’ll find more of Kim’s gorgeous work over on her blog. Today I’m sharing a couple of 6″ x 6″ cards I’ve made using some fantastic Visible Image stamps. Butterfly INKognito and Butterfly Sentiment. I created the background using Distress Inks in 3 colours, and then used a stencil over the top and spritzed with water, to give the sun ray effect. 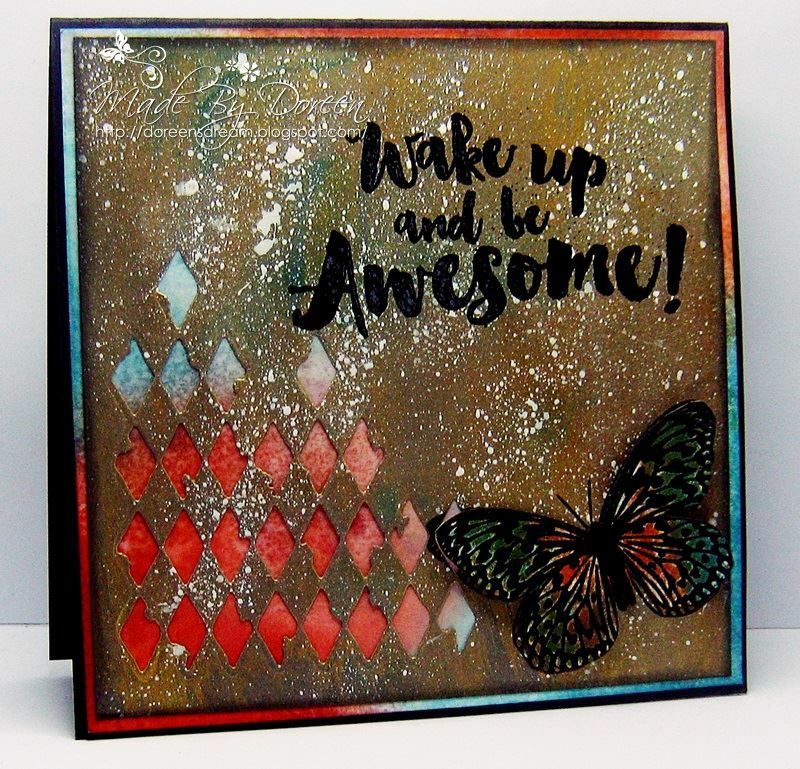 I stamped the butterfly and sentiment with versamark and heat embossed with black powder. I then added 3 colours of Stickles to the butterfly to give the sparkle. The stamps used on the second card are…..
Woman INKognito, Ripped Fishnet and ‘Love Yourself’ from the No Regrets Set. 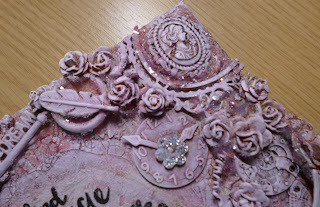 The background for this card was created with Brusho’s and water, left to dry, then stamped the Woman in Versamark and heat embossed using Black Embossing powder, I masked her off and stamped the Fishnet with Versamark, and heat embossed that using Pink Embossing powder. I then went over the Woman with a Black Viva Perlen Pen, to make it very dimensional, I also added some Stardust Stickles, and some Pink Stickles for sparkle of course. 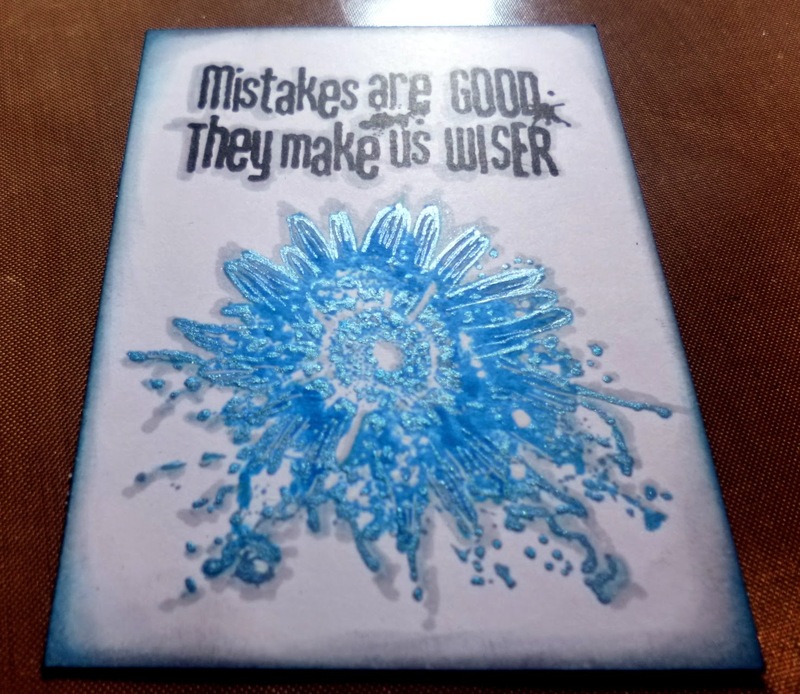 I coloured a small piece of card with Distress inks, spritzed with water, then stamped the sentiment with Versamark and heat embossed with Black embossing powder. 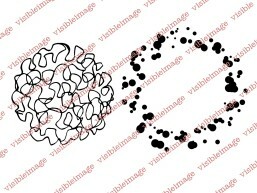 I am now going to spread a little ‘Visible Image’ love.. I never tire of using these fabulous stamps, apart from the superb quality, these thick polymer stamps are made in house, hand poured and hand cut by Mark, the designer himself, so they are very very unique in every way. Helen does all the packaging, administration, and networking, together they make an Awesome Team. So if you’ve not tried the stamps yet, have a go and see what you think. 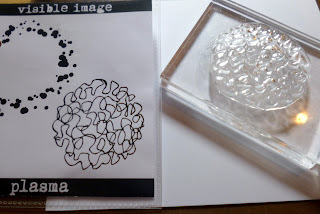 A new Visible Image ‘Show and Tell’ challenge has started, so get stamping, and produce some work to enter it, details HERE. Check out the Visible Image Facebook group too for news of goings on, HERE. Two absolutely stunning cards from Pauline! Isn’t that background incredible and so perfect for our inky butterfly! And the second card is just so funky! LOVE that pink <3 Woman INKognito looks superb! You can get your hands on these gorgeous stamps HERE. Why not treat yourself?! If you are coming to Ally Pally next weekend you will be able to see these gorgeous cards displayed on our stand, along with so many more from our amazing team… they always make our stand look totally awesome! Bye for now. Come back tomorrow to see new inspiration from Amber.